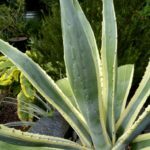 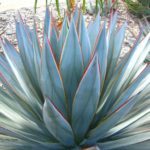 Is Agave the same as Cactus? 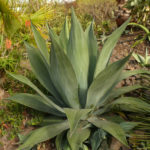 The United States Department of Agriculture says that agave plants are members of the century plant family Agavaceae, while the perennial varieties known as cactus belong to the Cactaceae family. 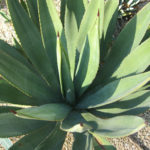 The agave plant is not a cactus, though both cactus and agave are classified as succulents, or “plants that have highly specialized anatomical features such as thick waxy cuticles, fleshy or minimal leaves, modified leaves (spines), and roots with extra storage capabilities for food and water,” according to the University of Arizona Cooperative Extension Service. 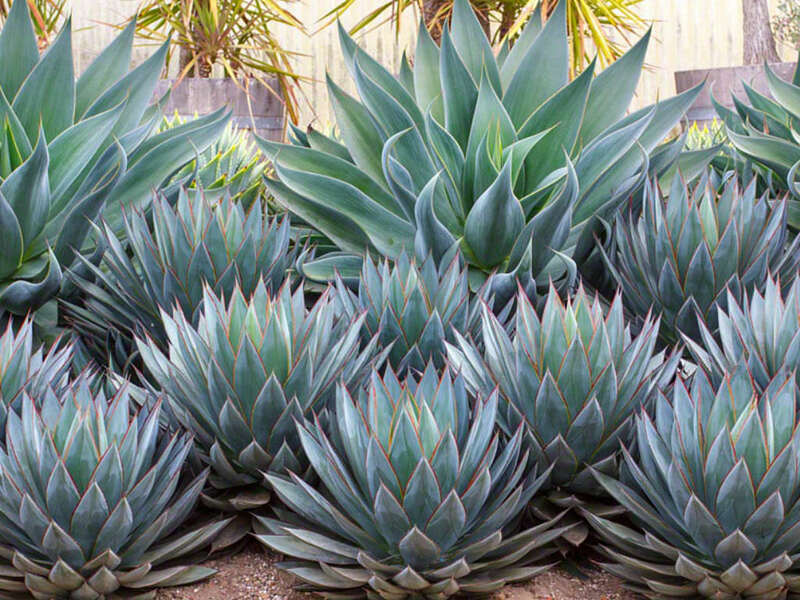 The majority of the hundreds of species of agave plant are monocarpic, meaning that they flower one time during their life, then die. 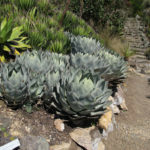 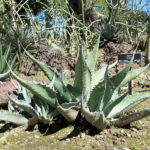 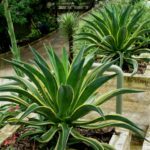 This includes species like the well-known century plant, Agave Americana, which may live as long as 30 years or more — but never a whole century — before flowering. 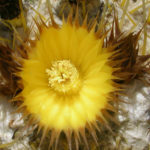 Dependent on the species, the majority of cacti flower on a regular basis. 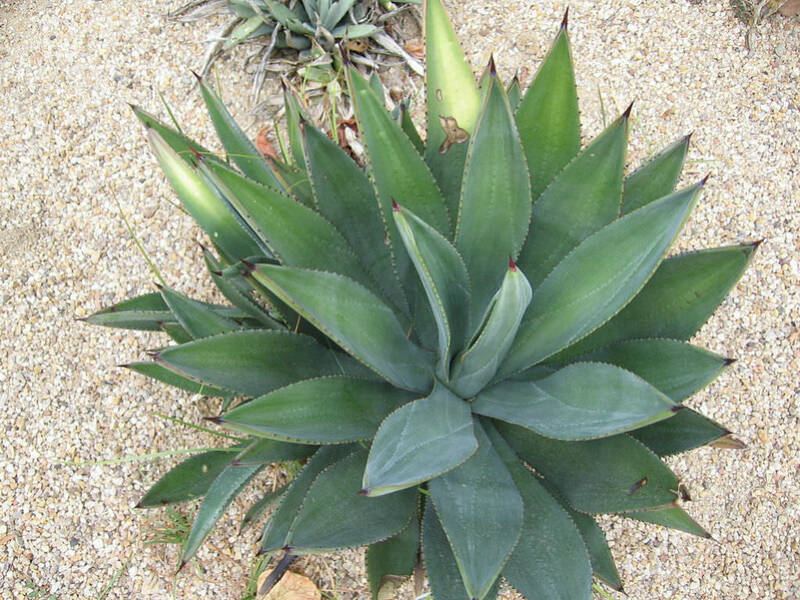 Another significant difference between an agave and the cactus are leaves — the agave possesses leaves and the cactus does not. 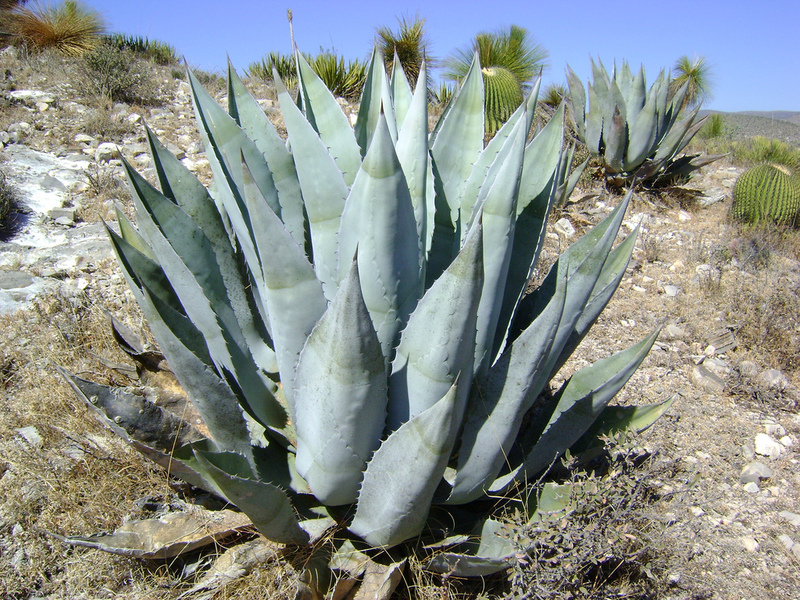 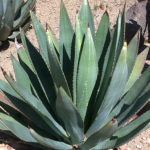 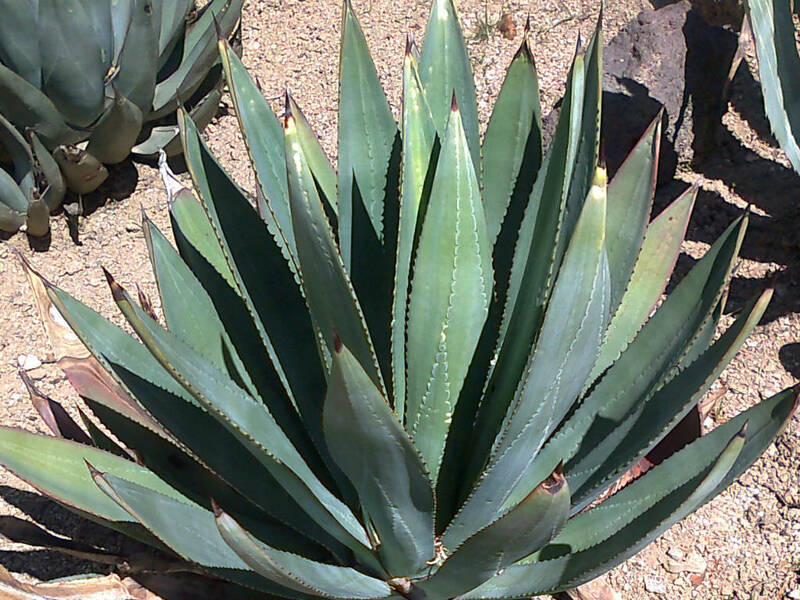 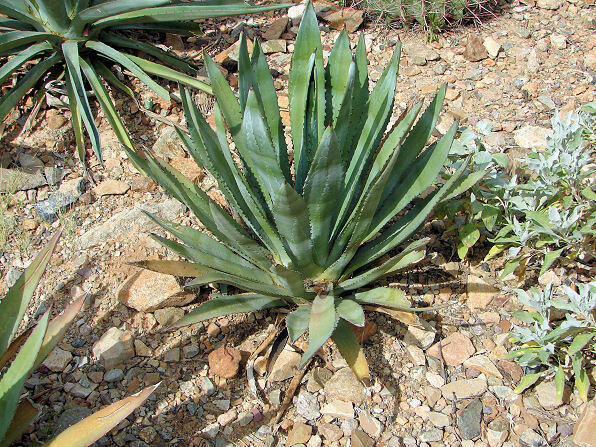 Many agave leaves — again, dependent on the species — are edible, provided they are cooked. 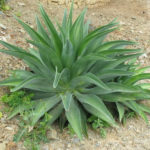 However, Native Americans in years past often used extracts from the uncooked agave leaf to poison the tips of their arrows. 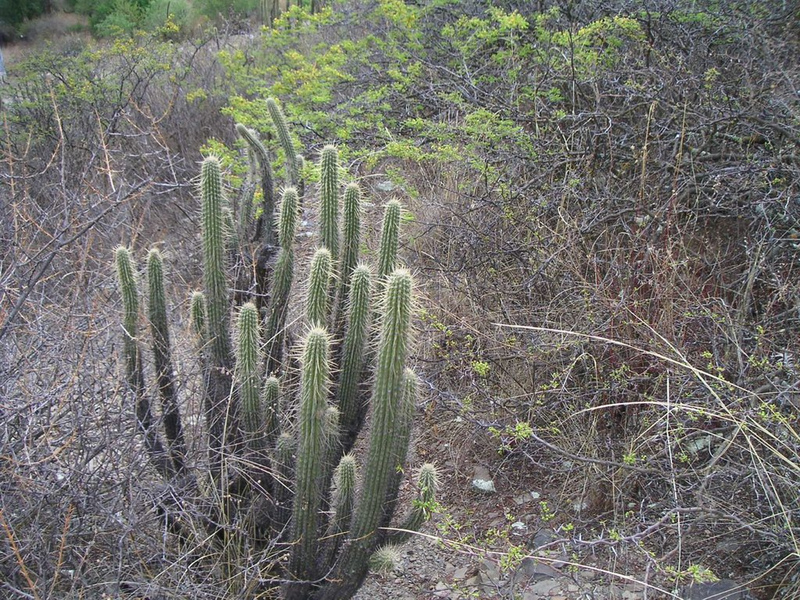 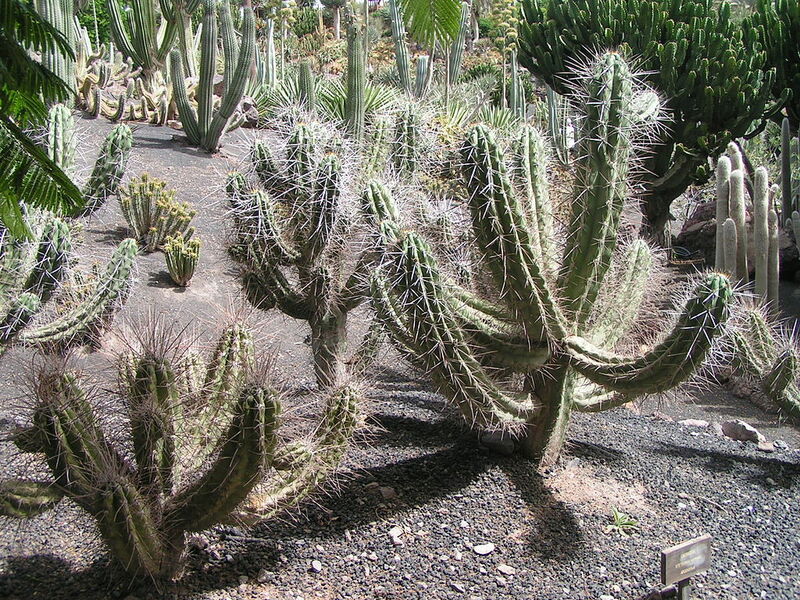 The green portions of a typical cactus are stems. 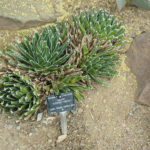 An evergreen succulent perennial which produces elegant rosettes of flexible blue-green leaves with finely serrated margins and a terminal spine. 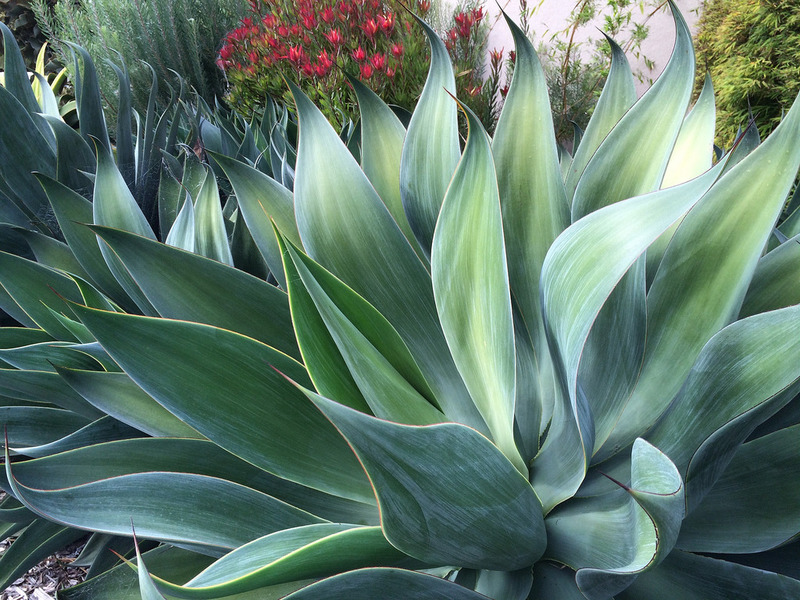 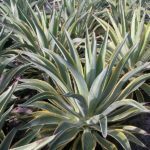 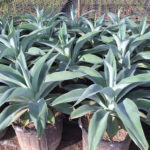 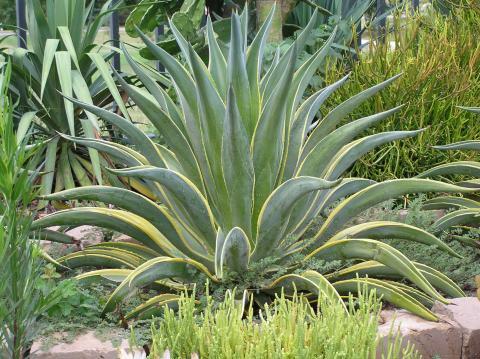 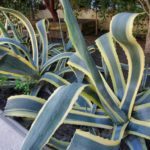 This desirable hybrid combines some of the best qualities of its parents: graceful form, beautiful color of Agave attenuata; enhanced hardiness, terminal spine and finely serrated margins of Agave shawii. 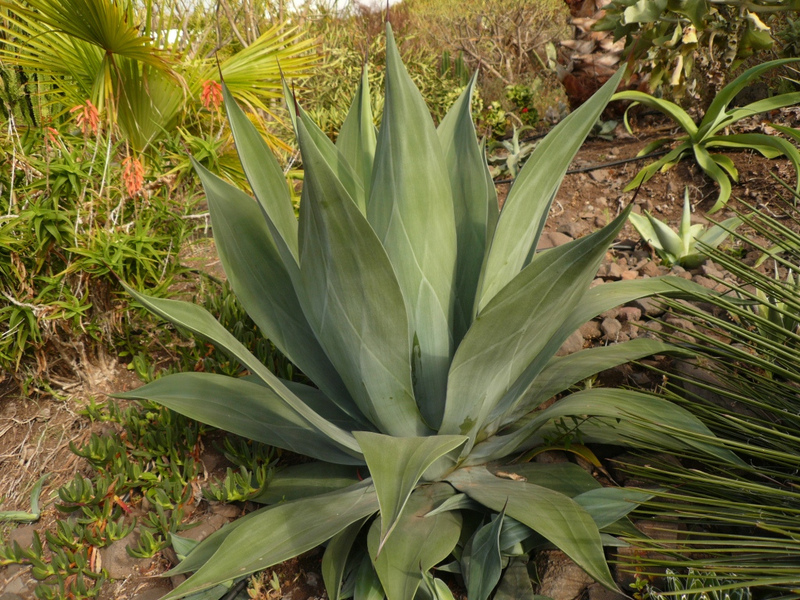 This Agave rarely flowers. 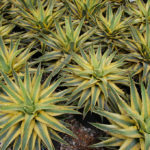 It makes a dramatic focal point or accent and can be used in decorative pots. 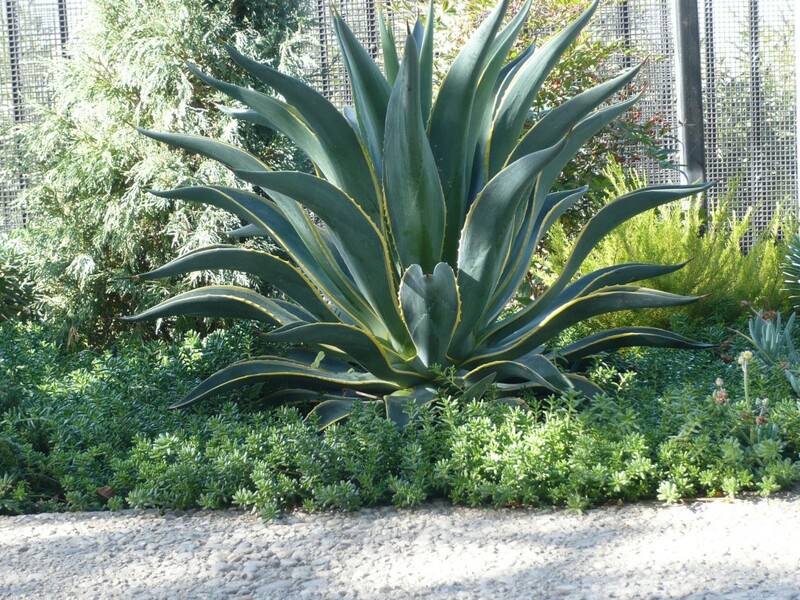 A study in architectural elegance for the dry garden, this hybrid Agave creates a beautifully symmetrical solitary rosette. 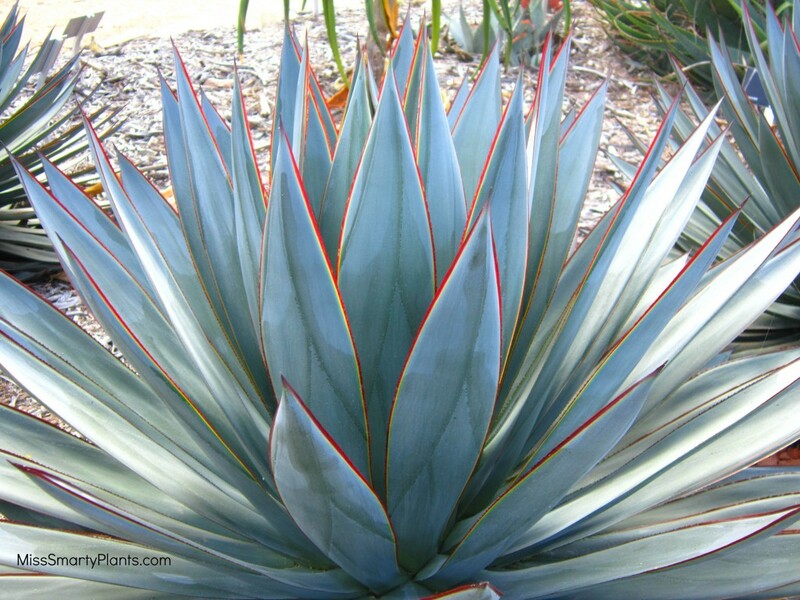 Chalky blue in color and edged in red and yellow (with a spiky terminal tip) the foliage "glows" when back-lit by the sun. 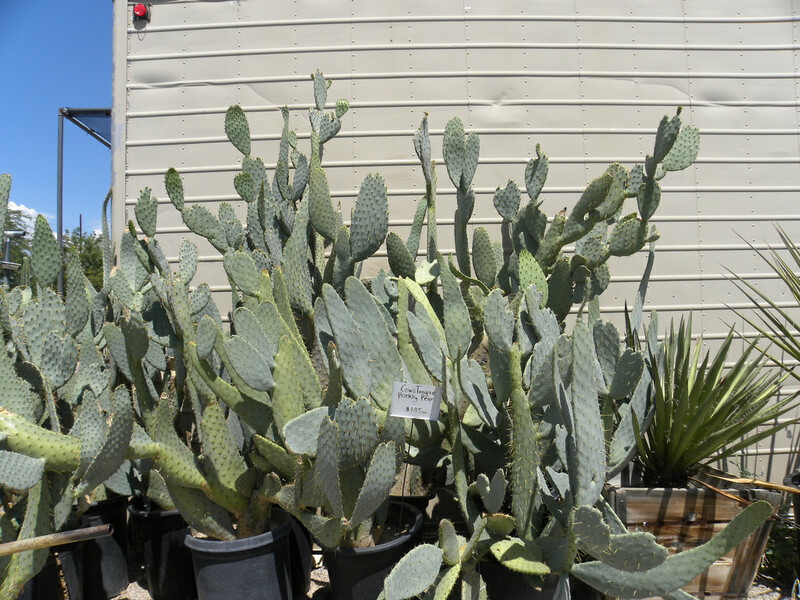 Reaching an easy to place 2' x 3' in size, group a few for a designer display. 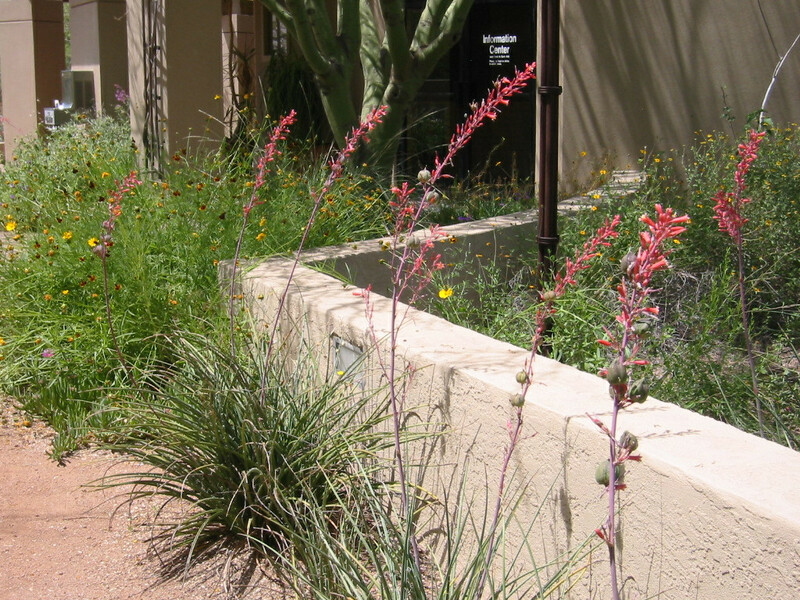 Benefits from supplemental water during hot, dry Summers. 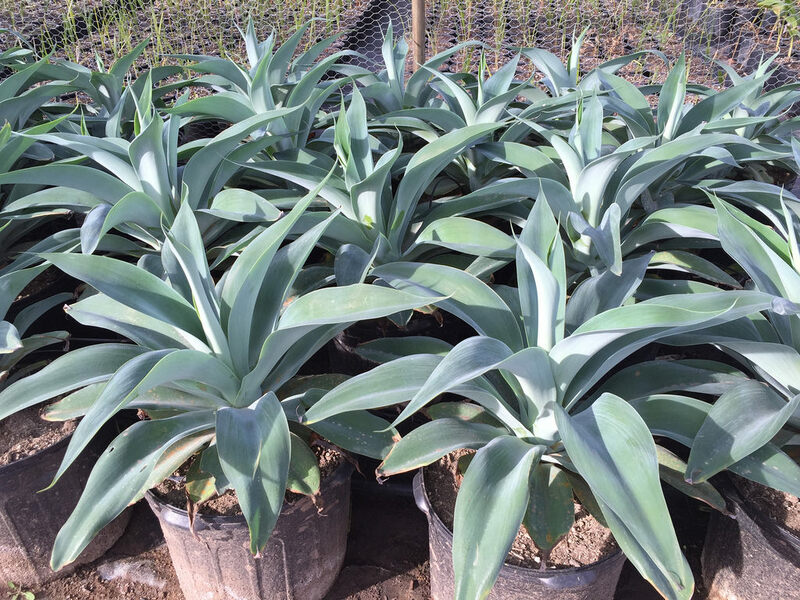 Slow growing and eventually makes offsets. 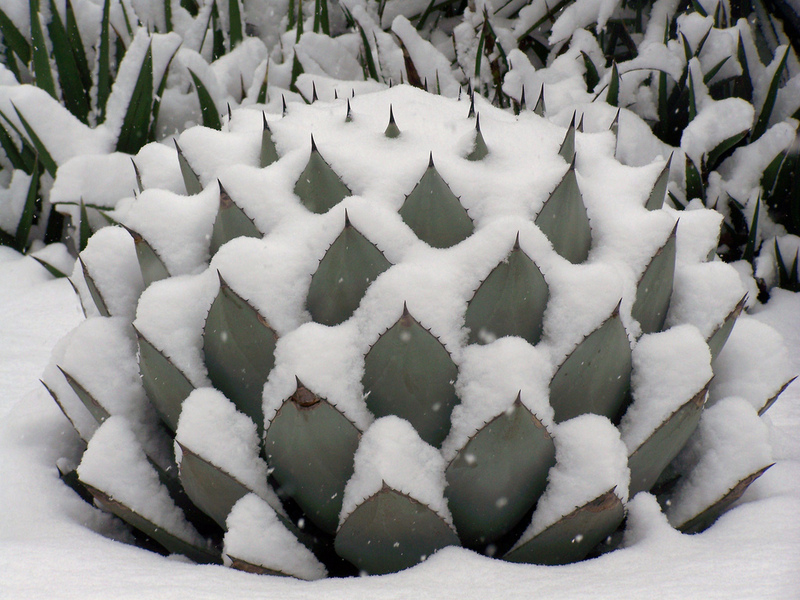 Hardy to 20-25° F. Deer resistant. 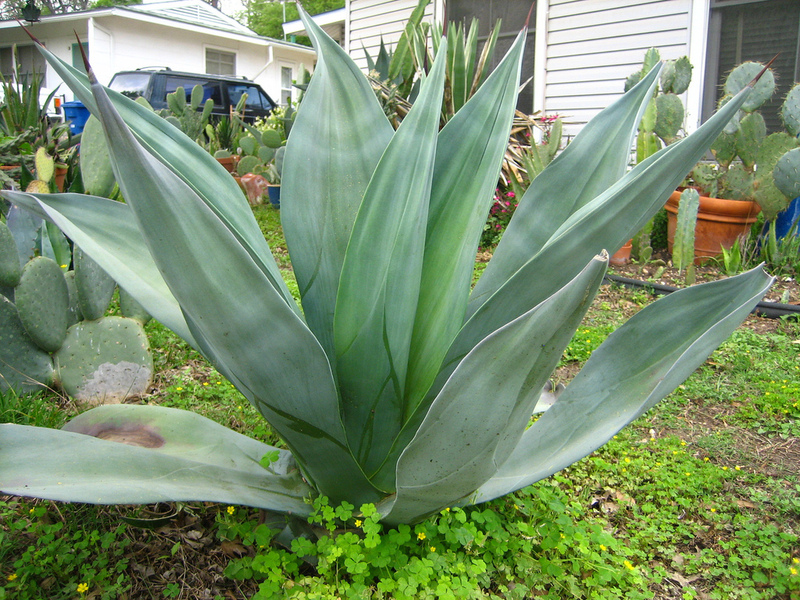 The largest and most majestic of the native Texas agaves, it often grows as tall as 6 feet. 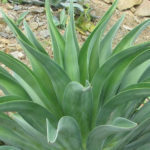 Its leaves are gray-blue to blue-green with spines at the tips and on the margins; the older leaves often gracefully arch down. 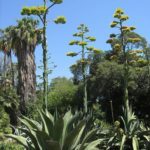 Century plant lives for 10 to 25 years (the "century" is an exaggeration) before it uses all its reserves to produce a magnificent flower stalk that can be 15 feet tall. 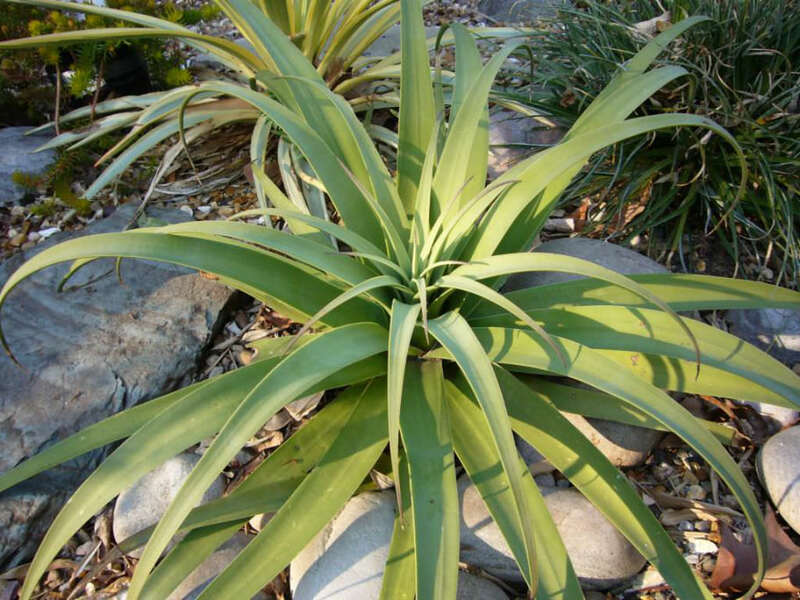 After that the original plant dies, but is replaced by small offshoots around the base. 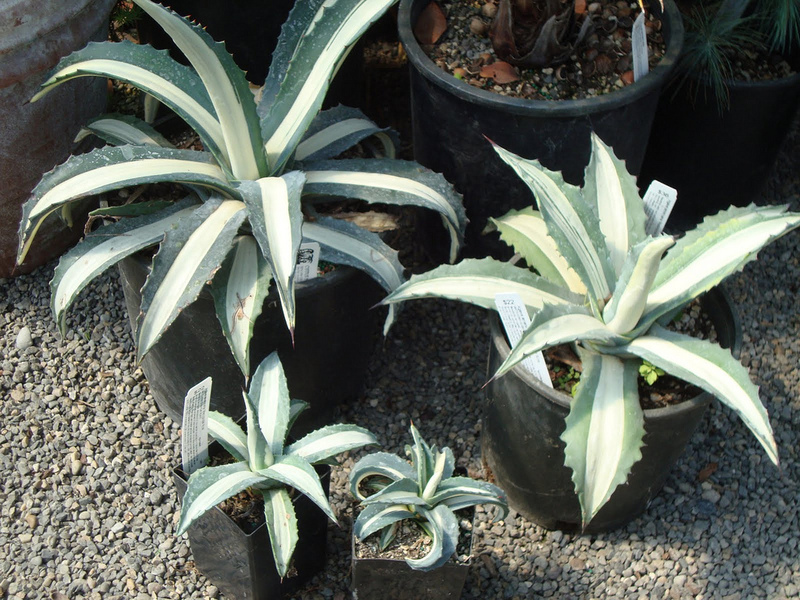 The "variegated" variety of Century Plant is similar in most respects to the non-variegated, aside from the notable difference in leaf color. 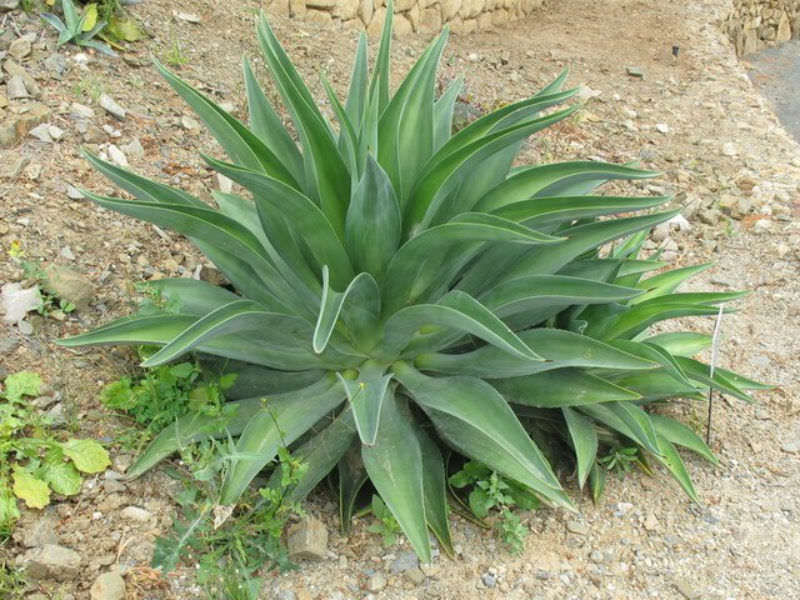 The Century Plant grows at a fast rate establishing thick leaves in a heavy "pup" cluster that can reach out up to 3 feet from the base. 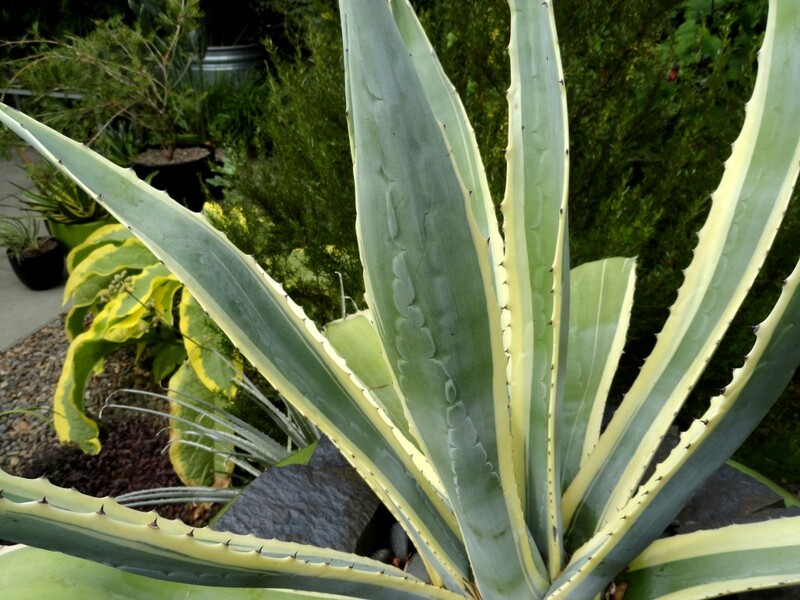 Variegated Century Plants boast a lighter, fleshier green leaf with a creamy white to yellow marginal variegation that gives this Agave Americana a highly unique appearance. 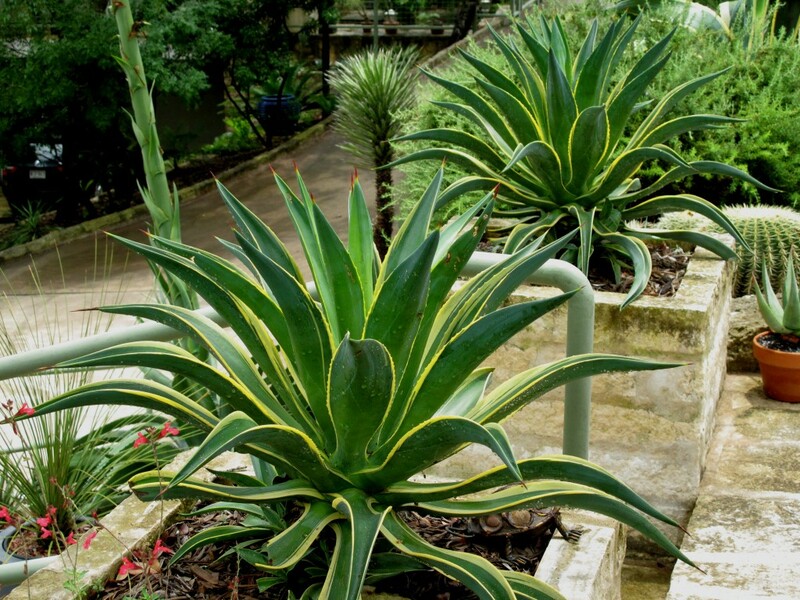 This upright plant forms a beautiful, symmetrical rosette shape with slightly arching leaves and grows three feet tall and wide. 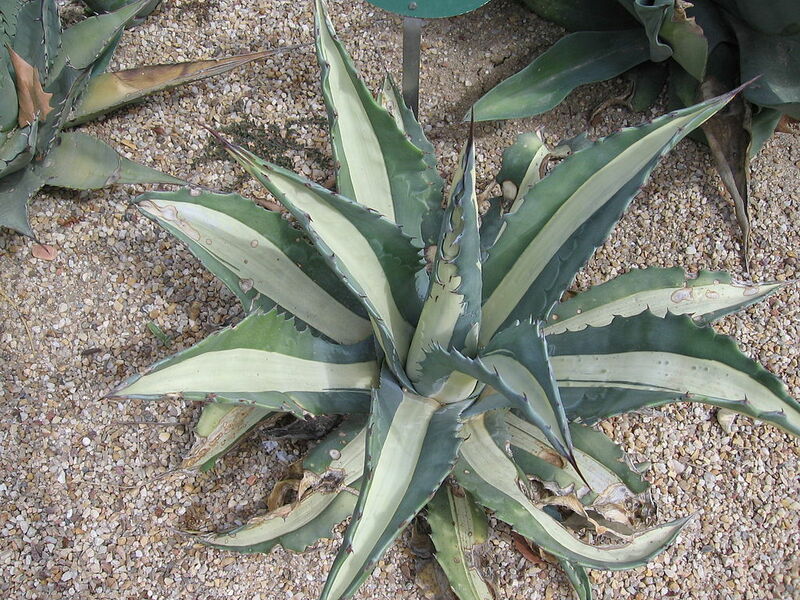 It has light, bluish-green foliage with smooth edges and a sharp spine at its tip. 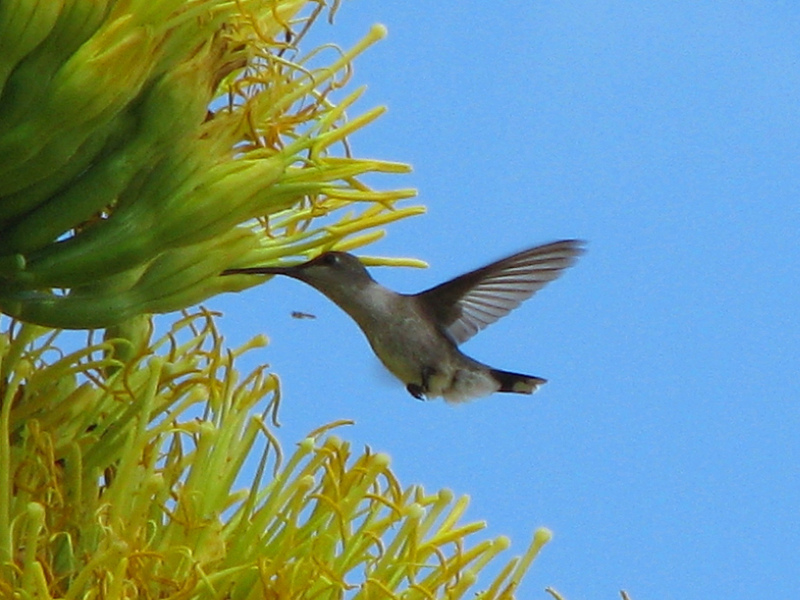 Sometimes, it develops small brown teeth along its edges. 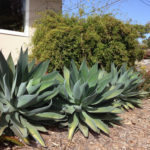 After eight to ten years, the agave develops an eight- to ten-foot high branched stalk with pale, yellow blooms.Smooth agave is only found in cultivation from a plant nursery, this agave originated in Sinaloa, Mexico. 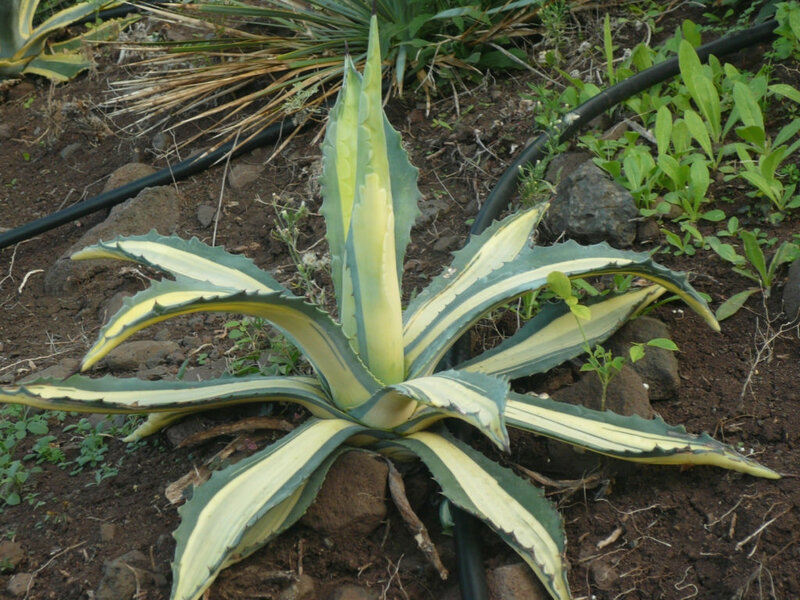 Variegated Agave desmettiana commonly referred to as variegated Smooth Agave because of it's spineless leaves. 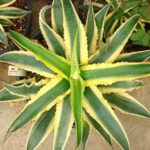 The long dark green leaves contrasted by yellow edges will curl upwards giving it a tighter rosette style appearance. 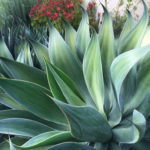 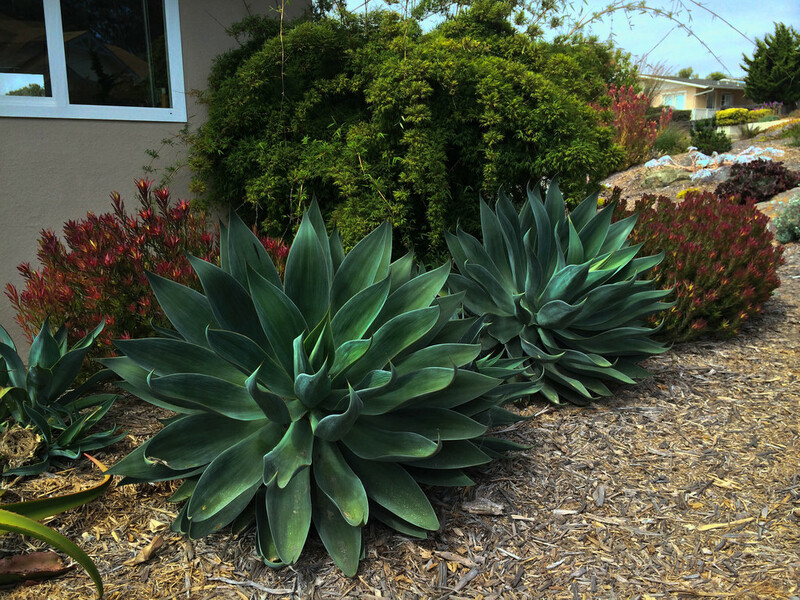 These succulent agave's are a water-wise as well as fire-wise planting choice. 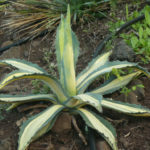 Agave desmettiana var. 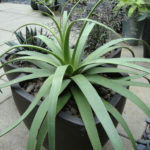 also work well in rock gardens, pots, planters or as stand alone succulents. 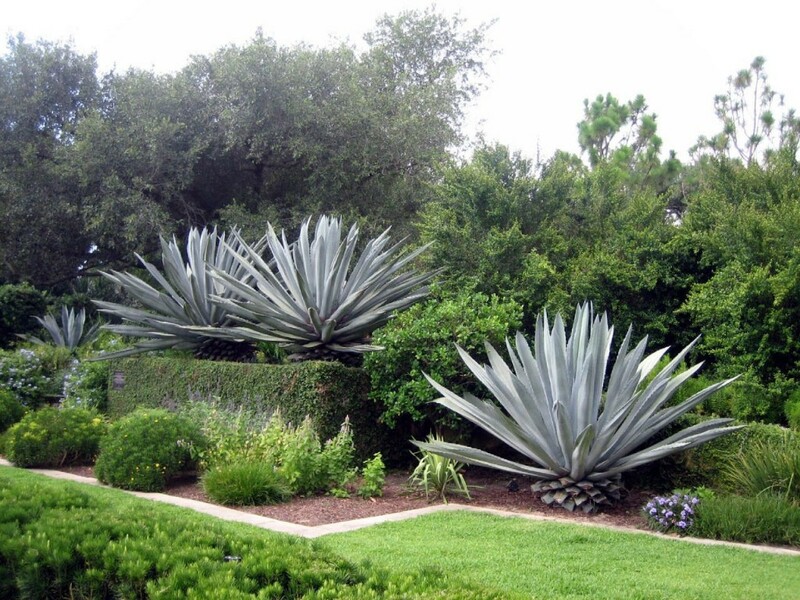 These agave grow to about 3-5' tall as well as wide. 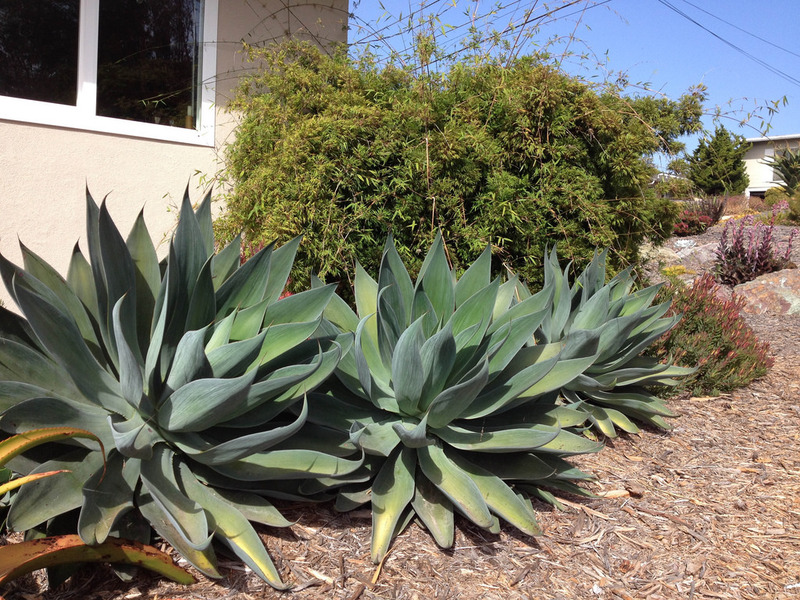 A stately succulent for a rustic or Mediterranean landscape. 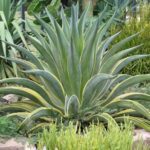 It quickly forms a big bold rosette with pale blue-grey leaves, striking in contrast with silver, grey or dark green plants. 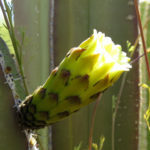 Produces a tall flower stalk at maturity. 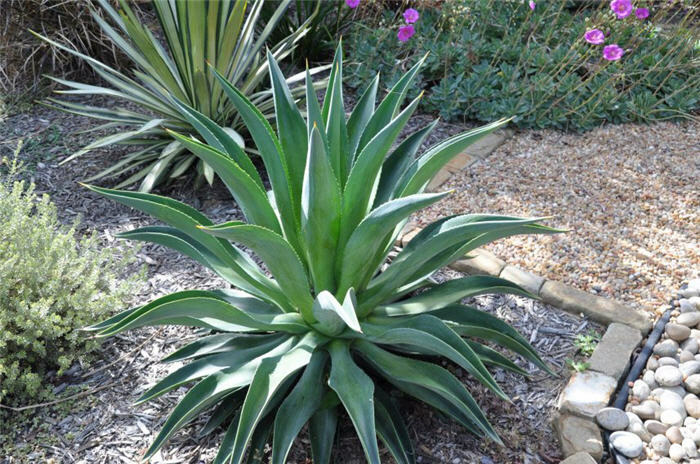 Once established, needs only occasional watering. 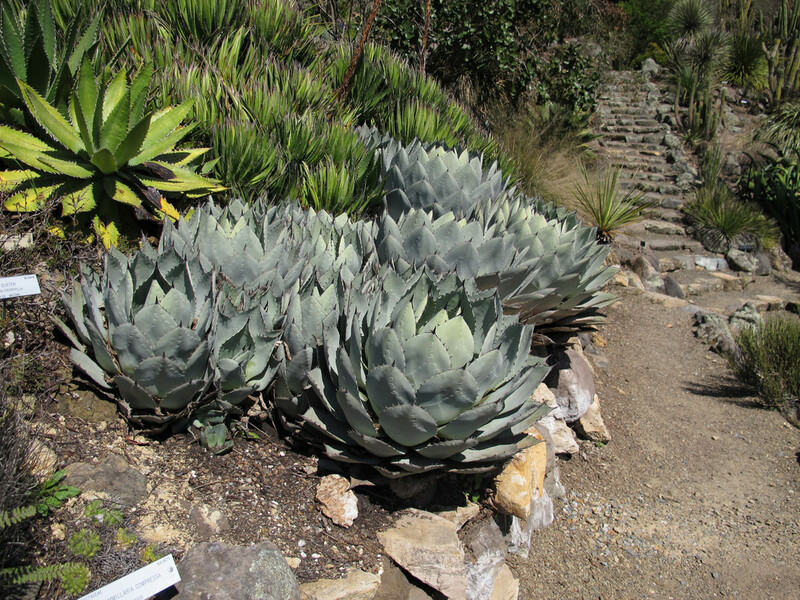 Handsome drought-tolerant accent for a dry rock garden or minimal-care hillsides. 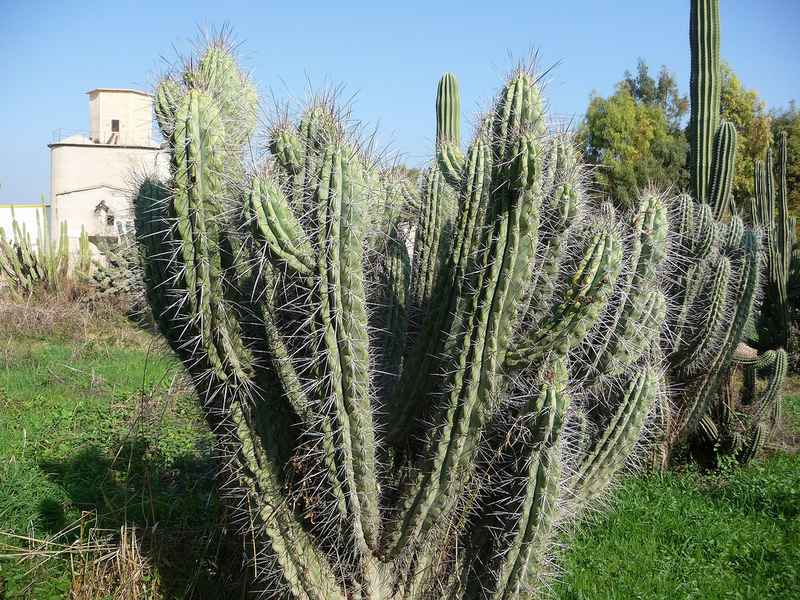 Evergreen. 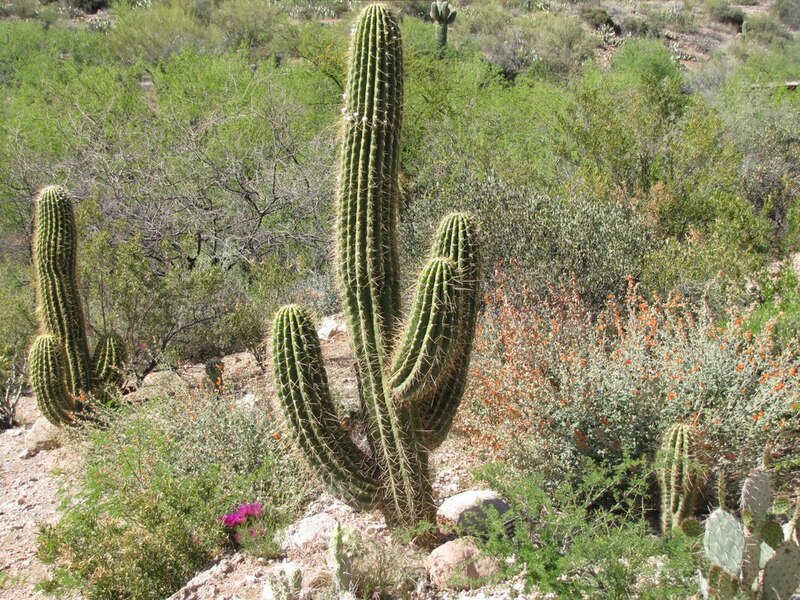 Reaches up to 5 ft. tall. 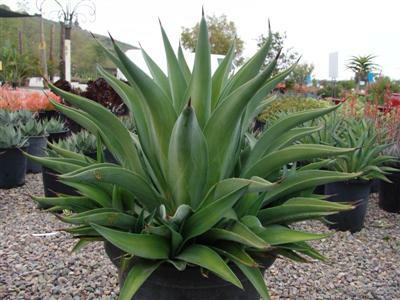 This dwarf agave is a bright unique addition to any landscape style. 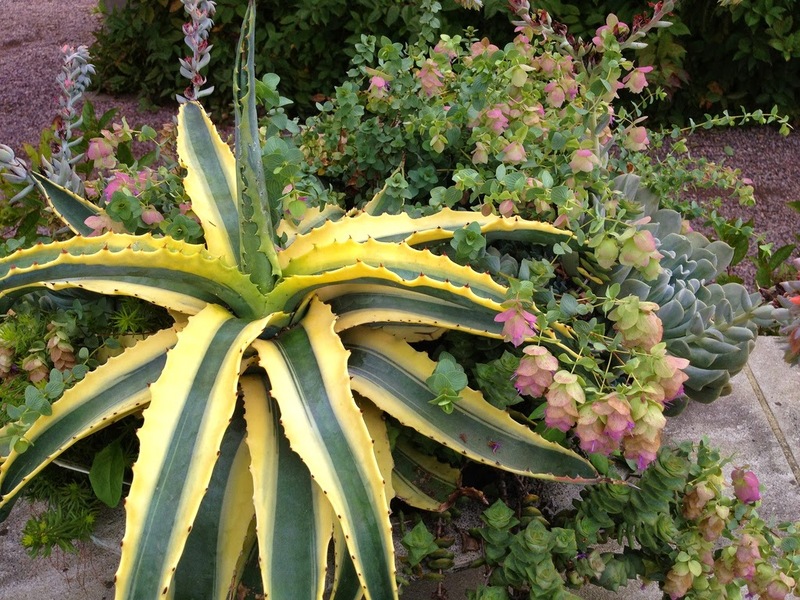 It has thick, wavy blue green and yellow variegated foliage with wide leaves. 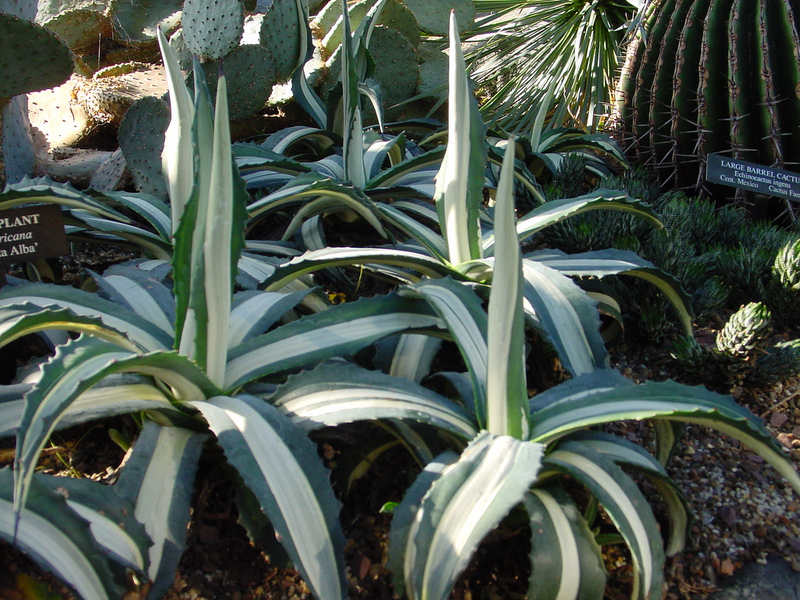 This spectacular plant has sharp black teeth along its leaves and a sharp tip. 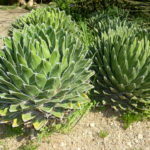 It will grow about two feet wide and tall to form an attractive medium-sized rosette. 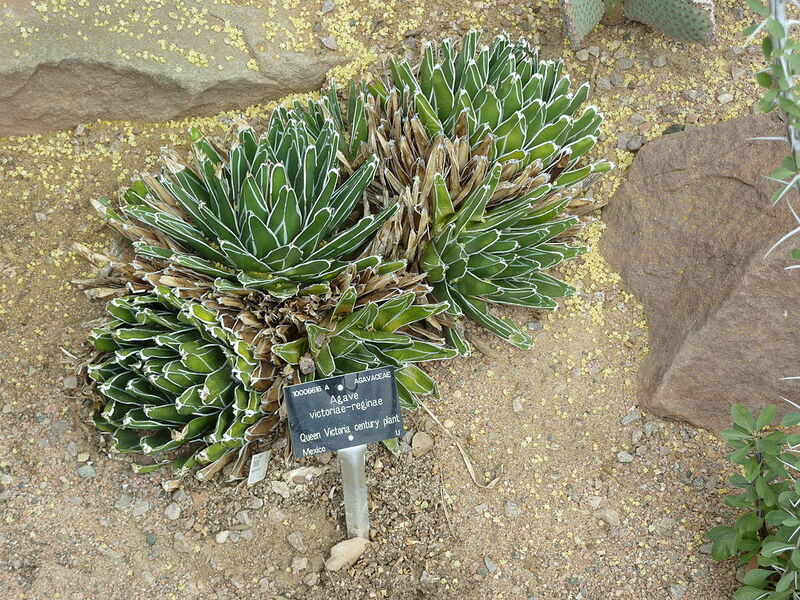 This plant is very slow-growing and will rarely produce offsets. 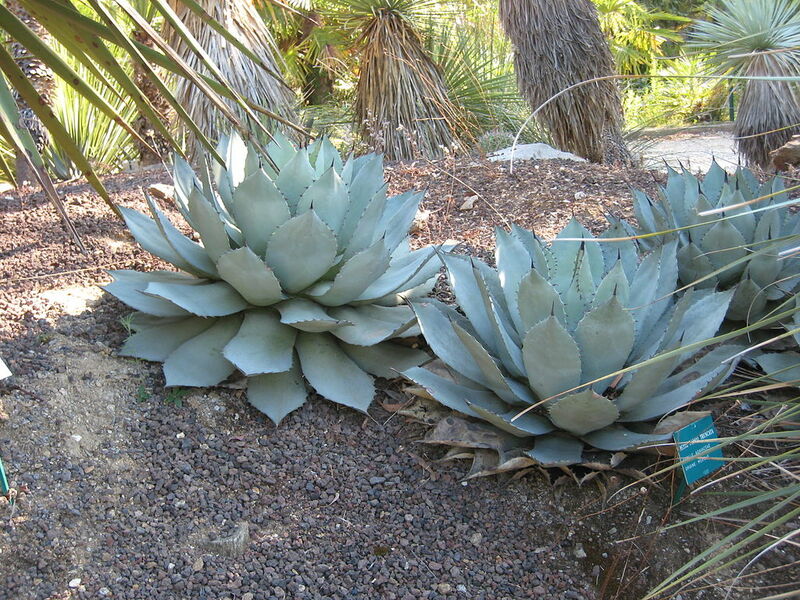 Plant this desert accent in showy containers, small rock gardens, and areas that do not receive regular irrigation. 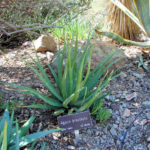 Parry's agave or mescal agave is a slow-growing native to Arizona, New Mexico, and northern Mexico. 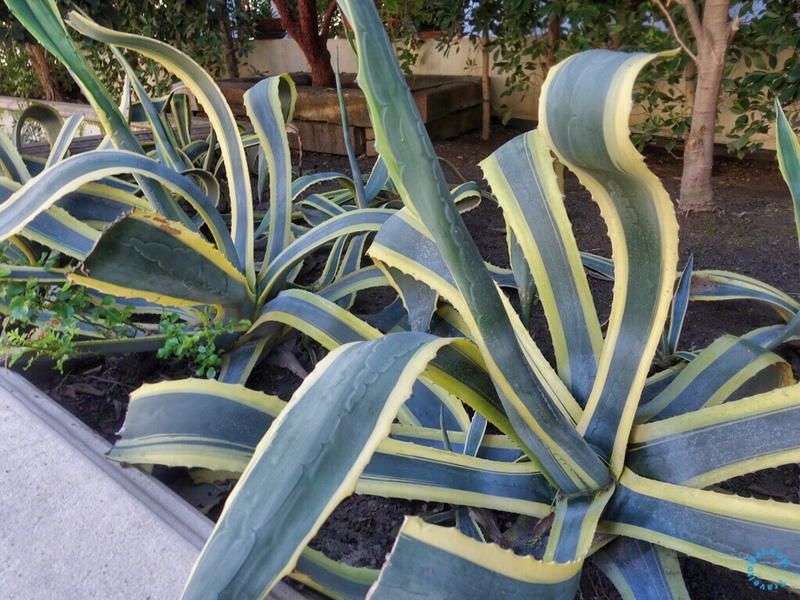 The leaves are grey green and have a spine at the tip. 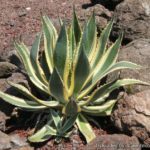 One of the distinguishing features is that the point on the tip, which is typically dark tan, brown, or black, is darker than the leaf. 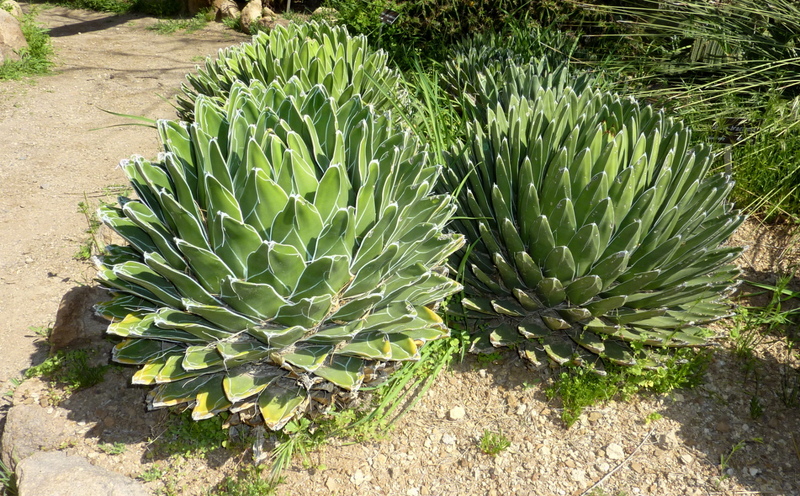 The rosette grows as large as 1 to 2 feet in diameter. 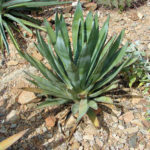 Parry's Agave is evergreen. 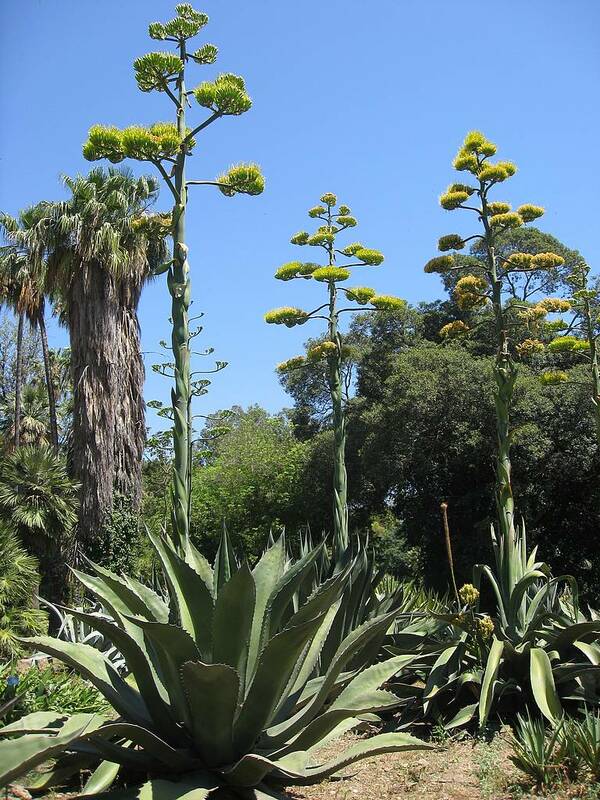 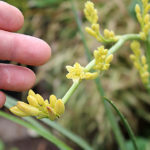 Mature plants produce a twelve-foot stalk with bright yellow blooms. 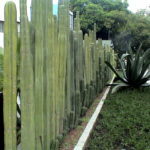 They are monocarpic. 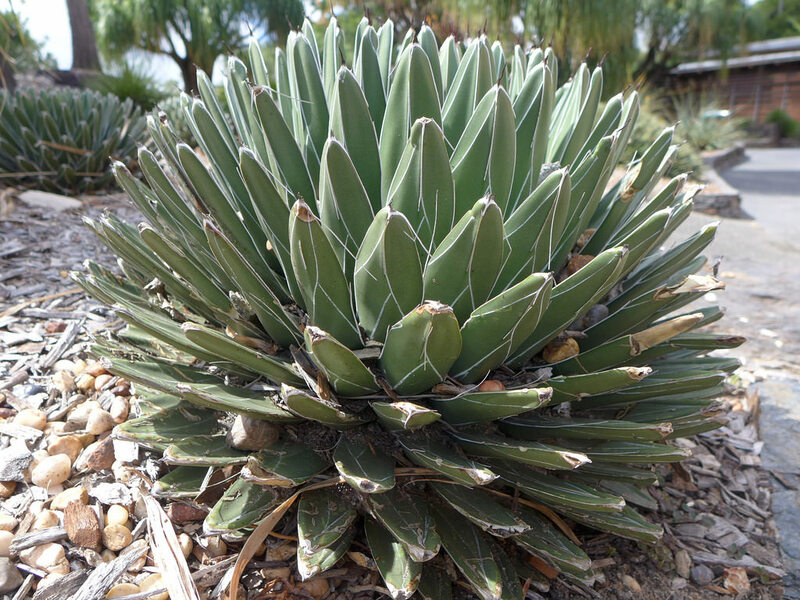 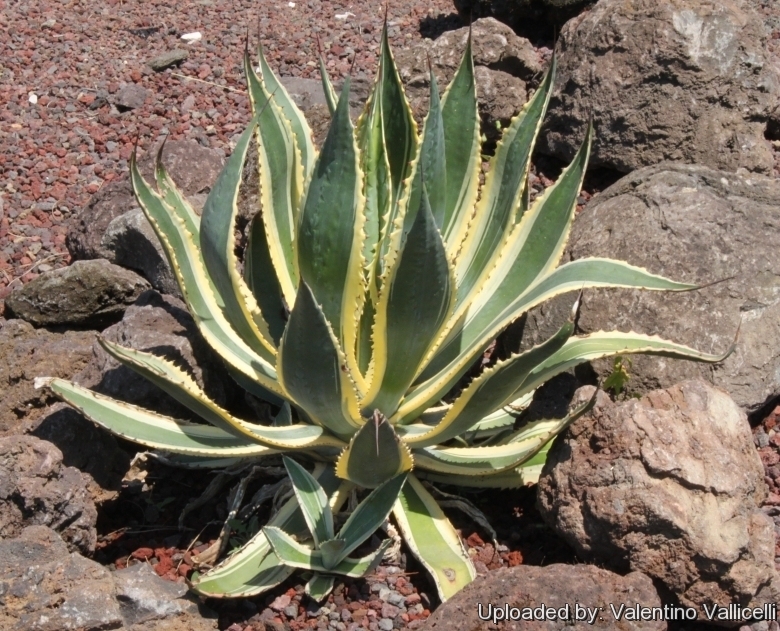 The tight rosette shape of Queen Victoria agave resembles that of an artichoke. 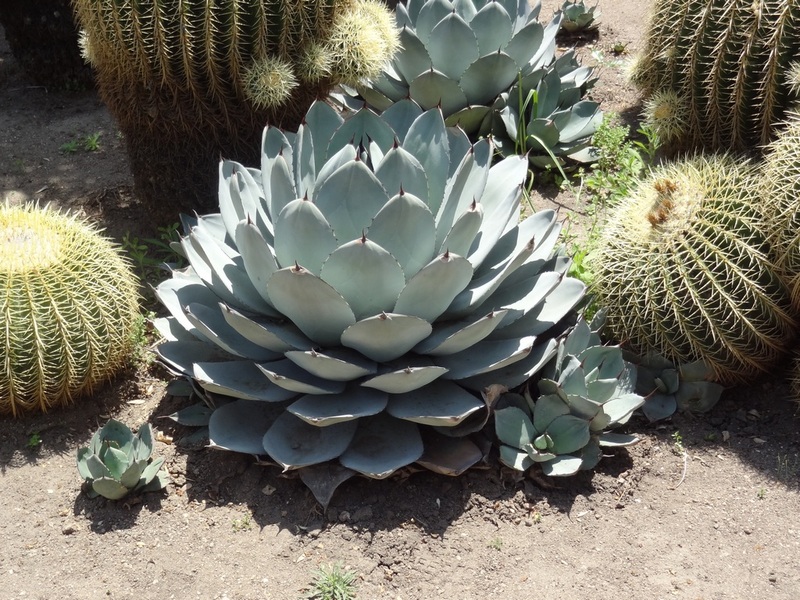 As the plant grows older, its form becomes spherical. 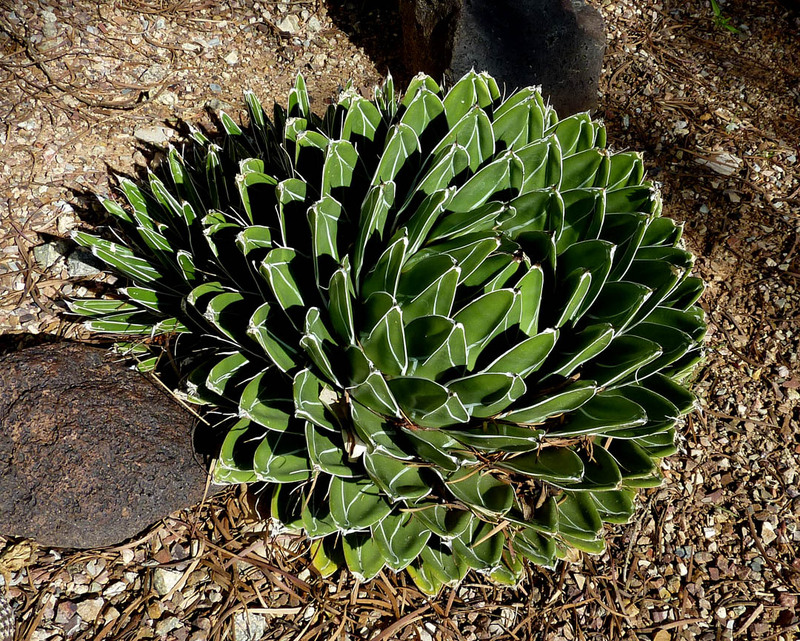 The rosette is made up of numerous dark green leaves with distinctive white margins. 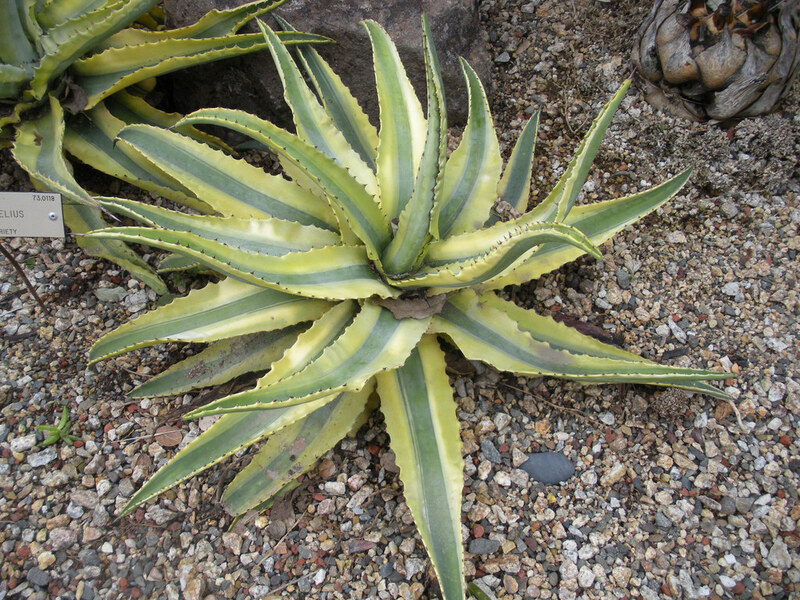 The edges of the succulent leaves are smooth, leading up to a single prominent spine at the top of each leaf. 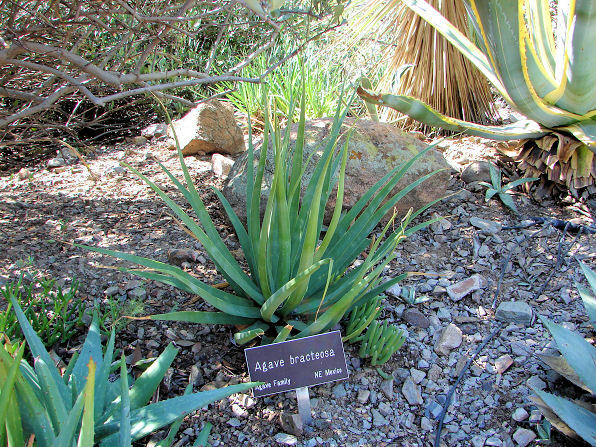 Although native to the deserts of Mexico, this agave can be found in many Southwest desert and semiarid landscapes. 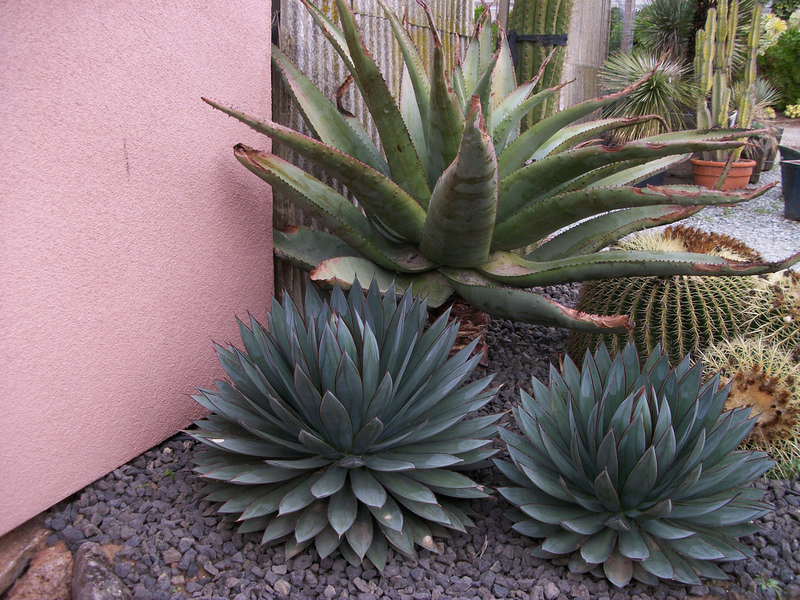 If you like Agaves but don't like spines, this is the species for you. 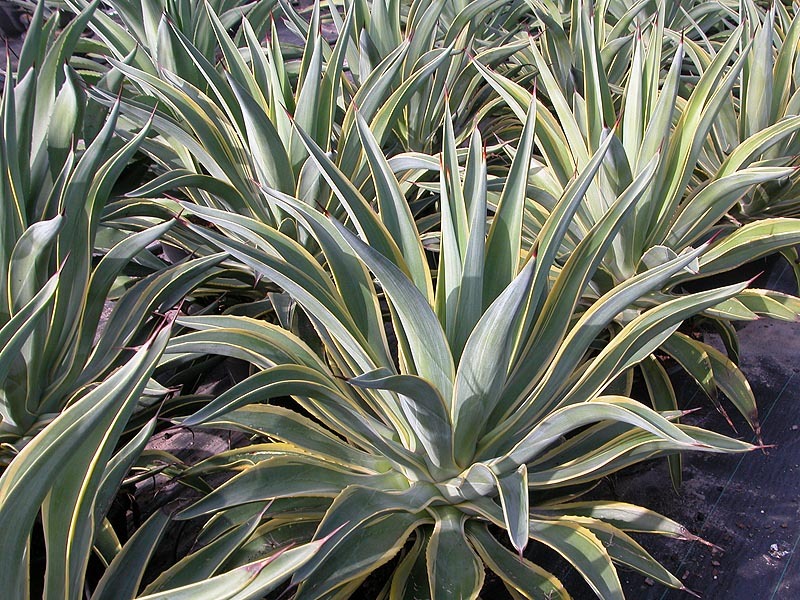 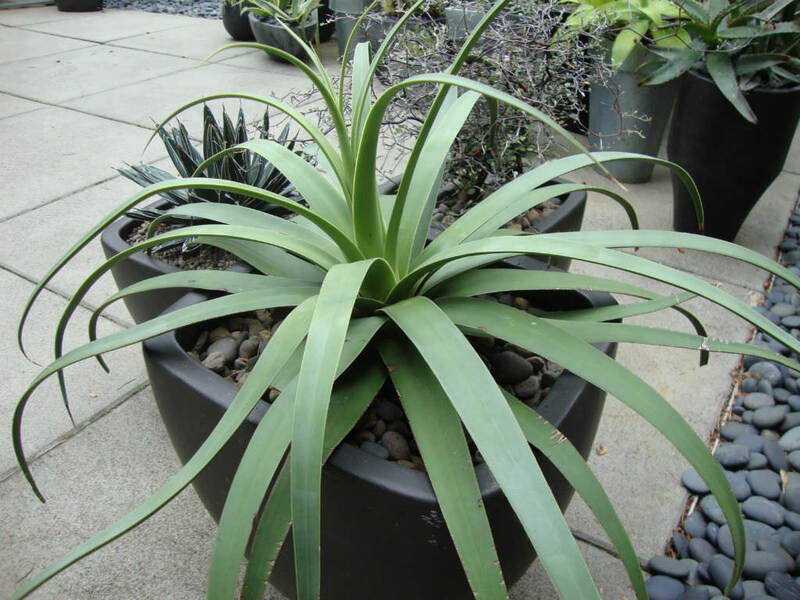 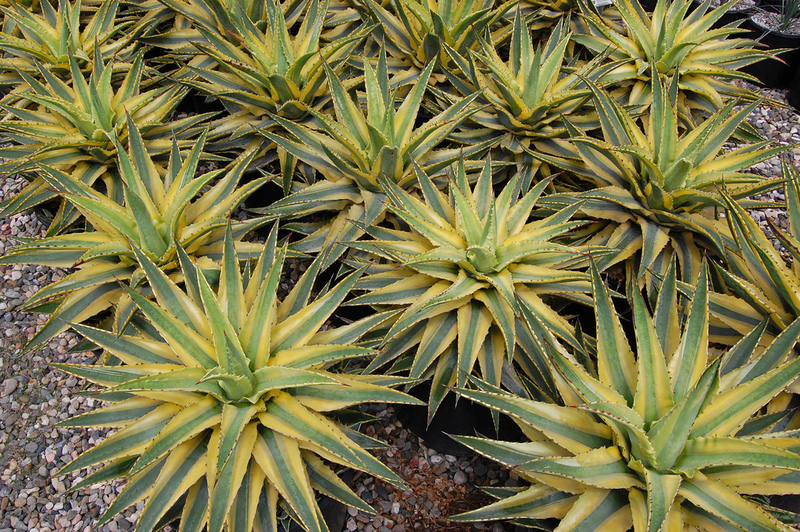 Perfect for patio containers or small planting spaces, Spider Agave rarely grows larger than one foot tall and wide. 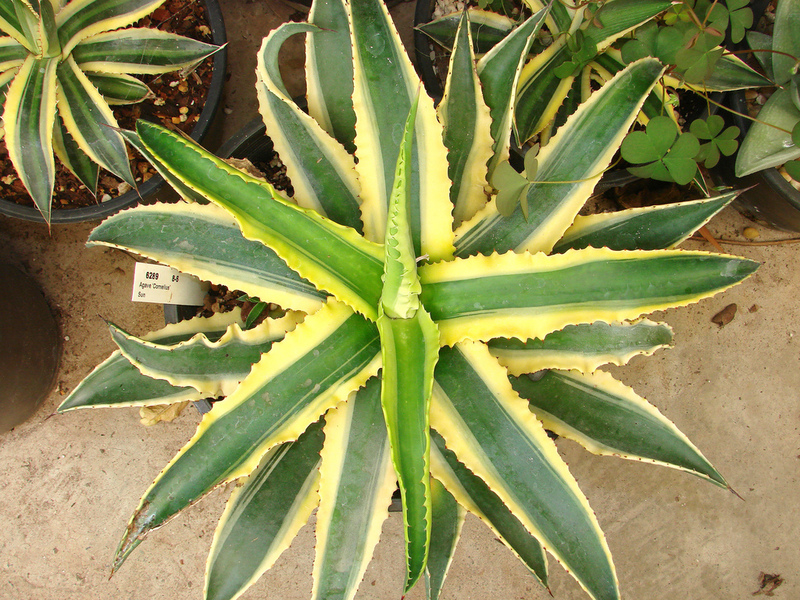 The flexible, spineless, lime green leaves twist and arch, providing a unique silhouette. 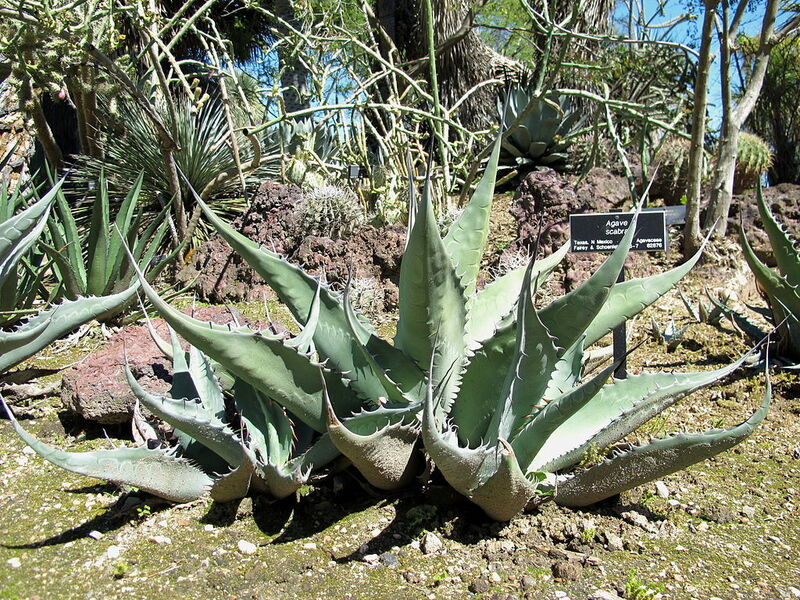 Older specimens often generate new plants from rhizomes or the leaf axils, resulting in a wide-spreading mound. 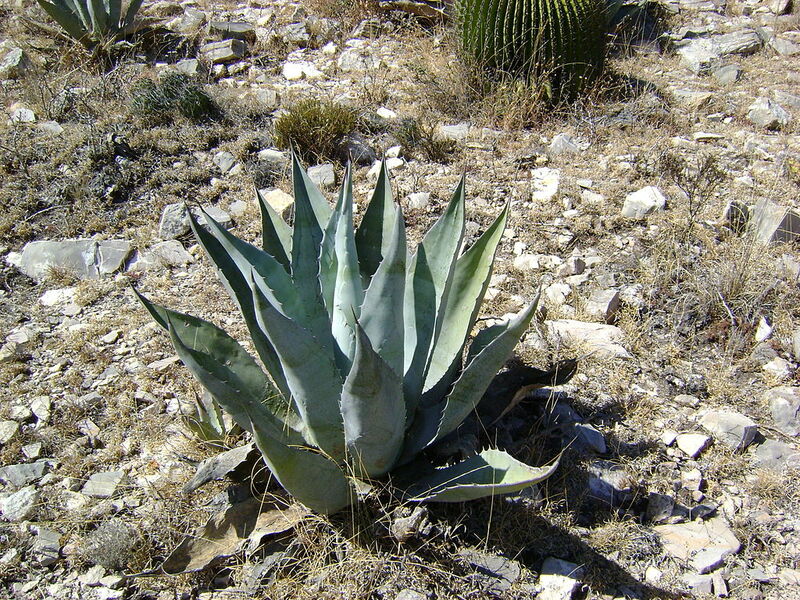 It is native to the Mexican states of Coahuila and Nuevo Leon. 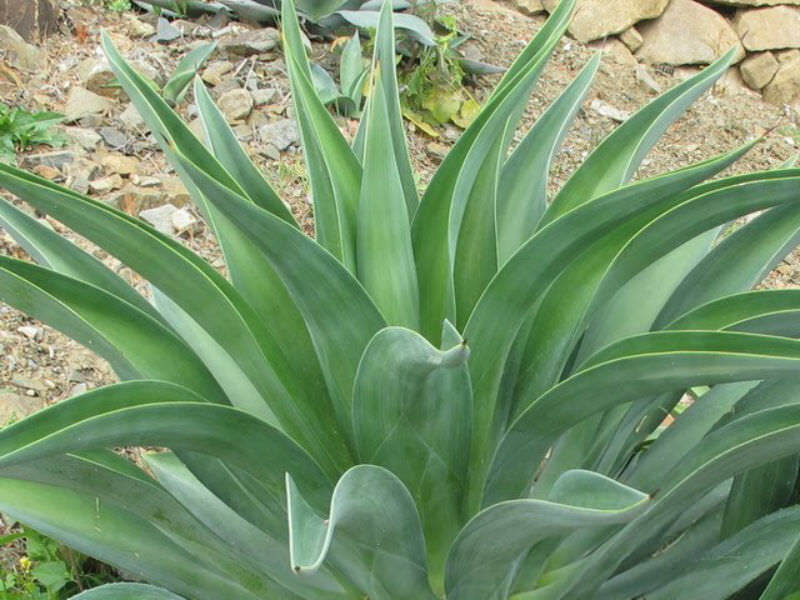 Beautifully variegated, diminutive form, with rosettes spreading to no more than 2-3', the beautifully curved leaves colored a dusty blue-green with a wide creamy stripe in the center. 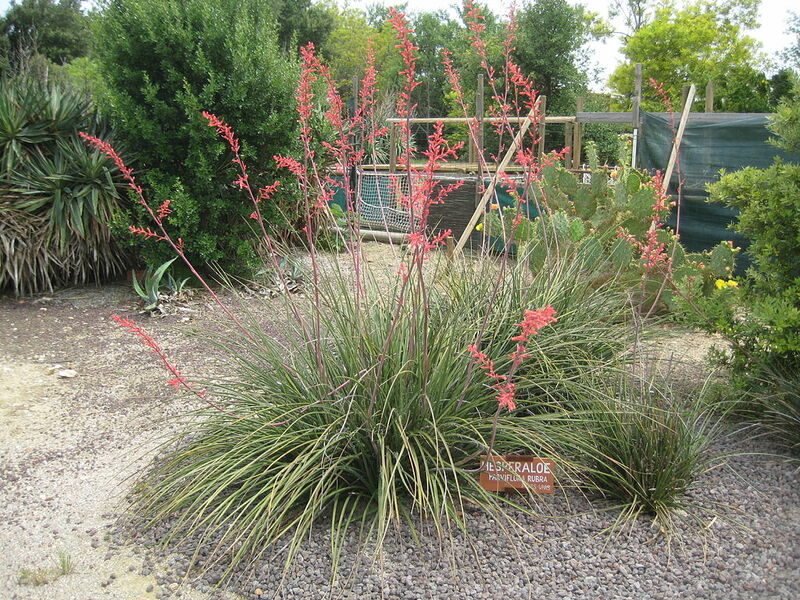 Slowly offsetting in bright light and well-drained soil with occasional summer water. 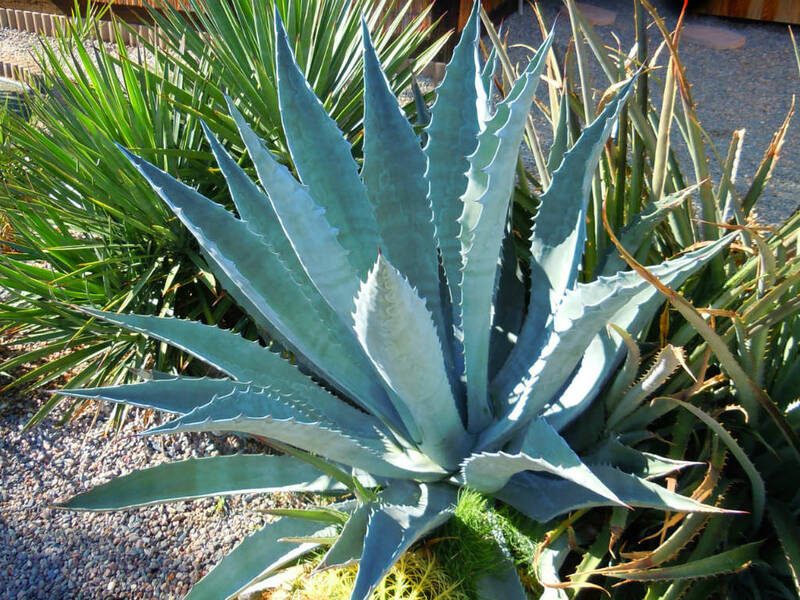 As luck would have it, this is one of the forms hardier to frost with plants surviving 10 to 15 °F, USDA zone 8, in soil that is dry in winter. 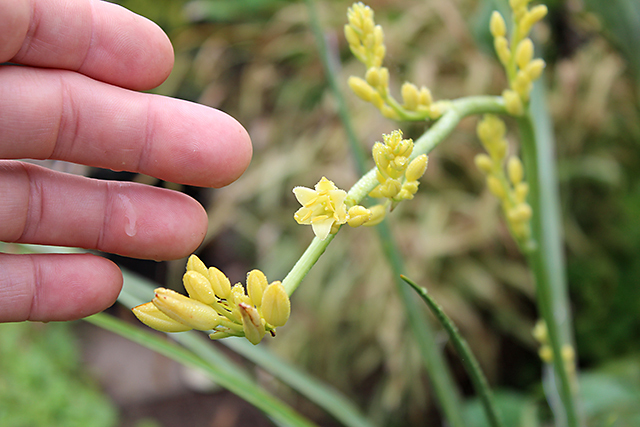 Pull in or cover below 20 °F or so in areas of winter wet. 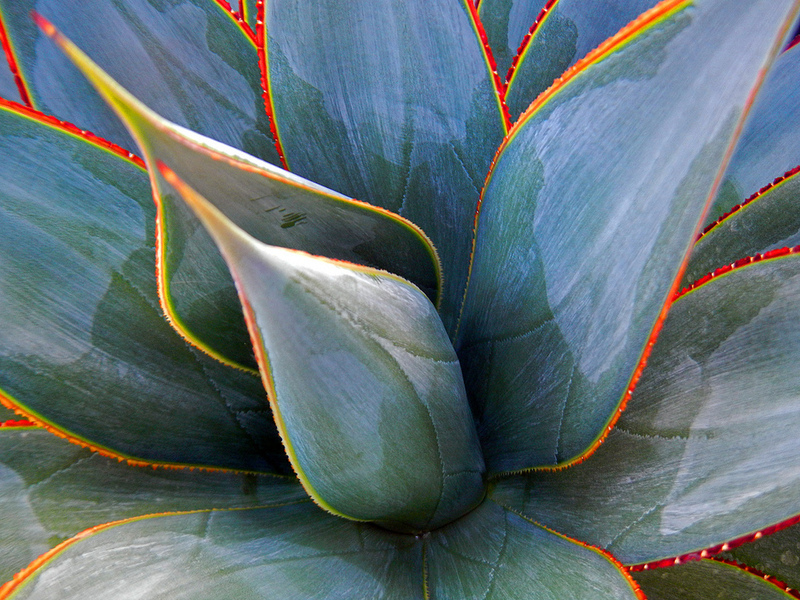 Rough agave is so named because of the rough texture to the undersides of the leaves. 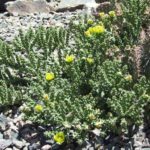 It is closely related and similar in appearance to A. americana but hardier when obtained from high elevation areas of its range. 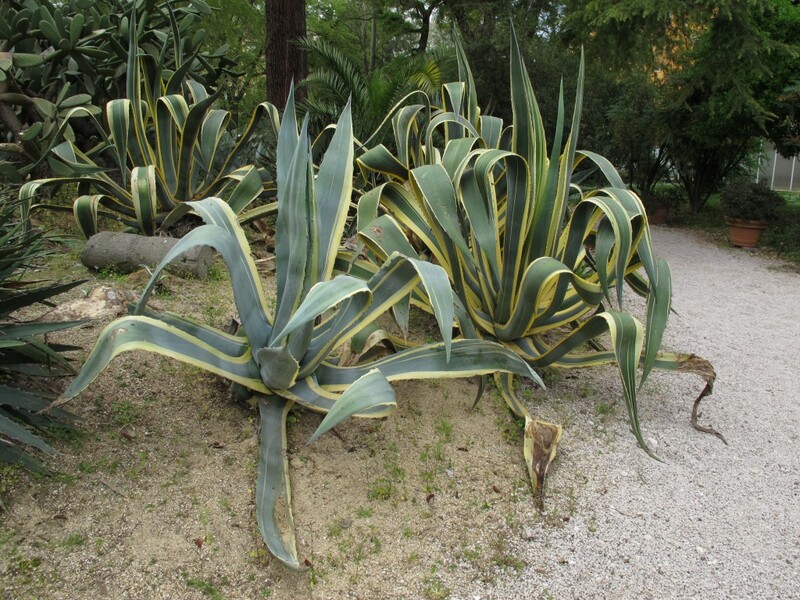 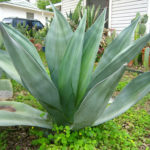 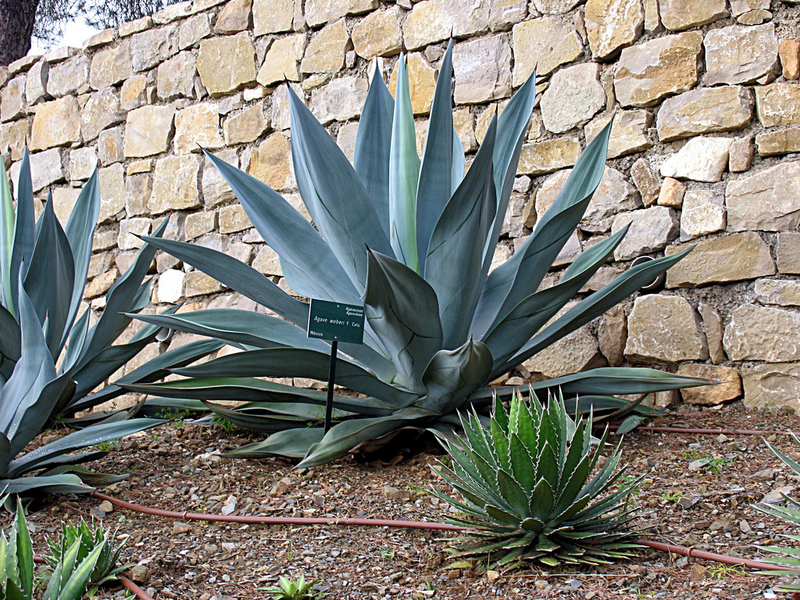 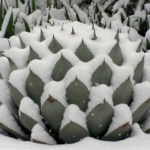 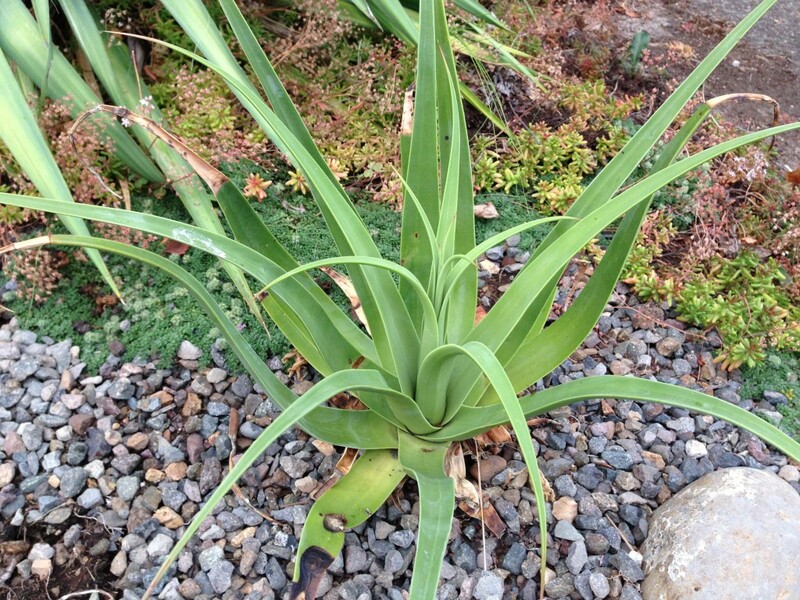 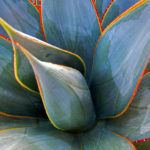 Good winter drainage is essential.Agave scabra is a medium- to large-sized plant that grows 3 to 5 feet tall and wide. 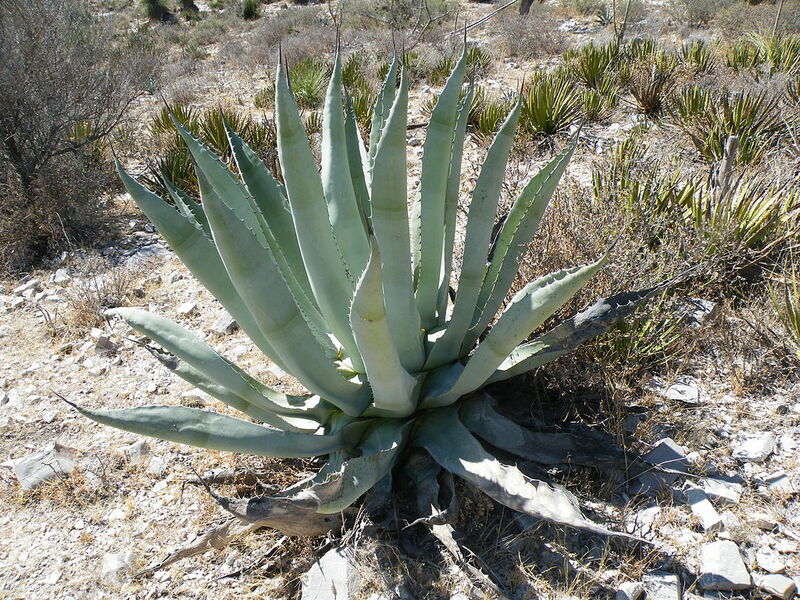 It grows on sandy and calcareous soils in the southwestern Rio Grande Plains. 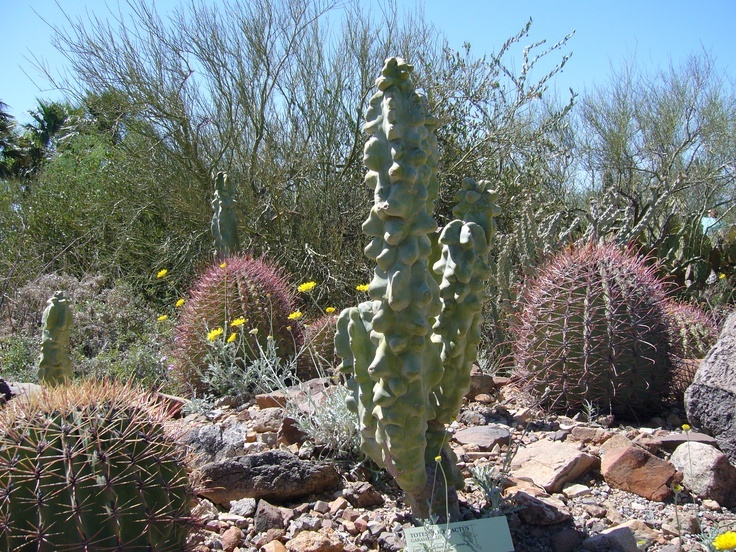 Cholla are very 'traditional' cacti and naturally store water within their structure, so growing Cholla requires very little, if any, irrigation. 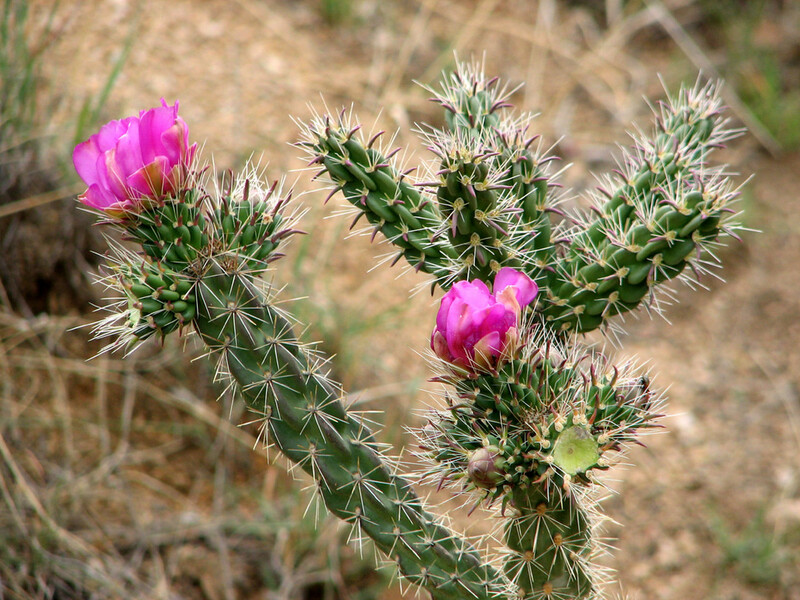 Cholla are popular for their large blooming flowers, which come in during late spring or after heavy monsoon rains during the summer. 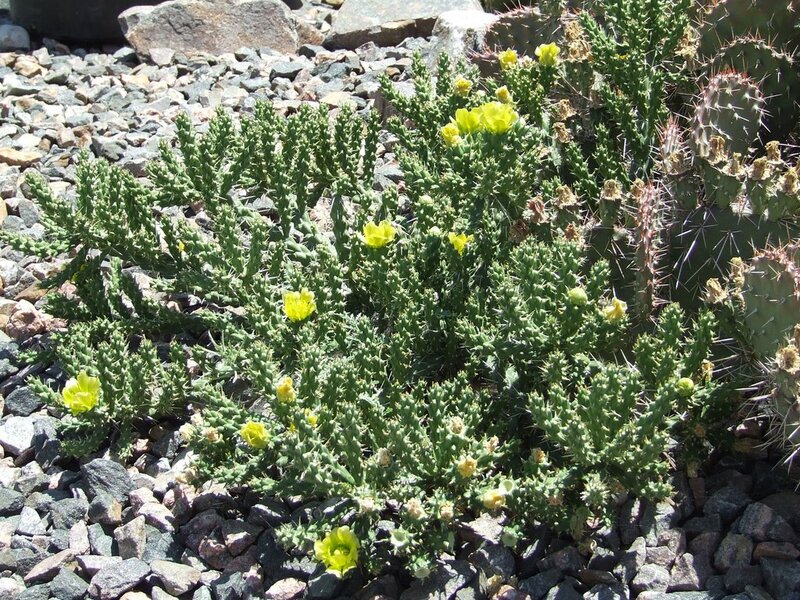 Most flowers are commonly bright yellow with 1-3 species per arm, however the flowers depend on species planted, and aren't always predictable. 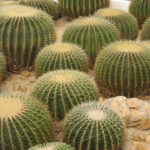 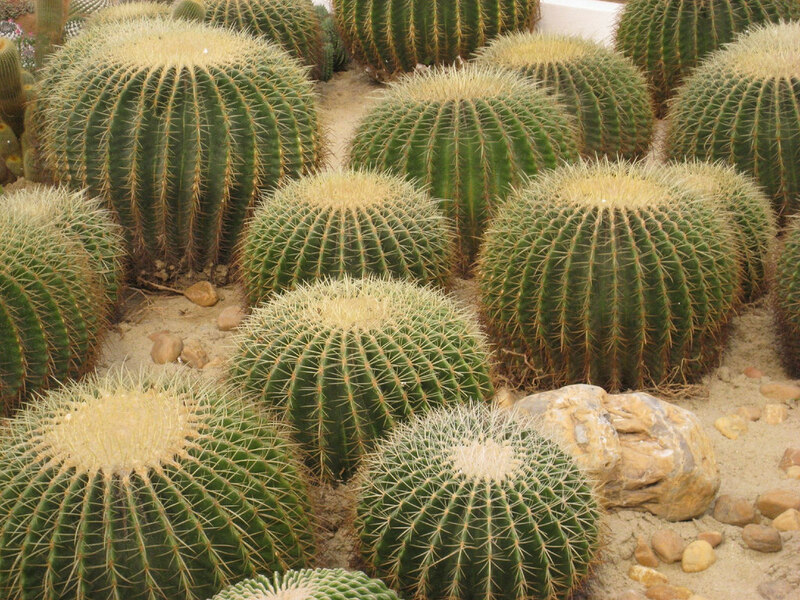 These barrel cacti are native to Mexico and the southeastern United States. 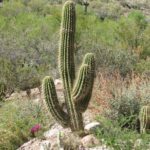 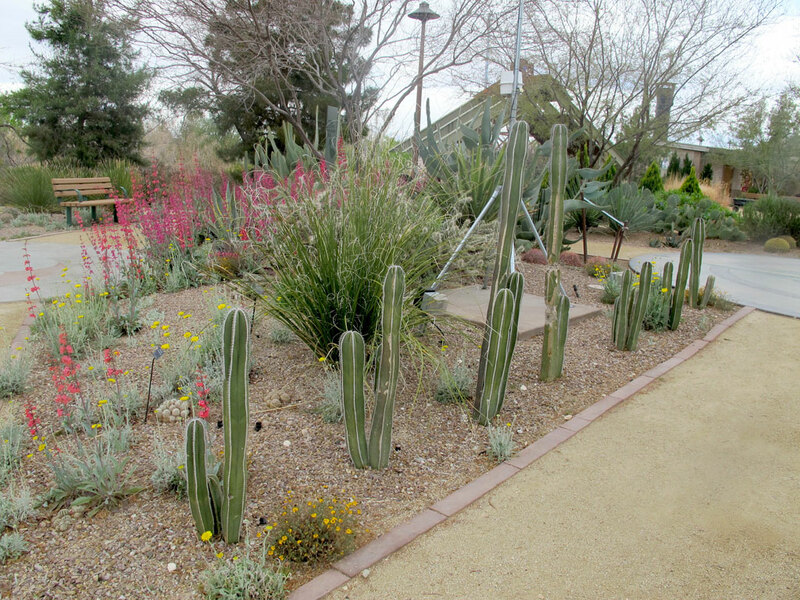 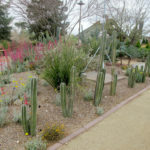 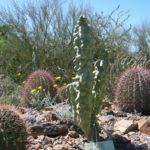 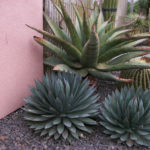 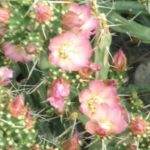 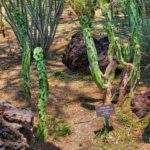 These are true desert plants that cannot handle any humidity or standing water to grow.They are also highly attractive, with evenly spaced rows or spines of their deeply ribbed lobes. 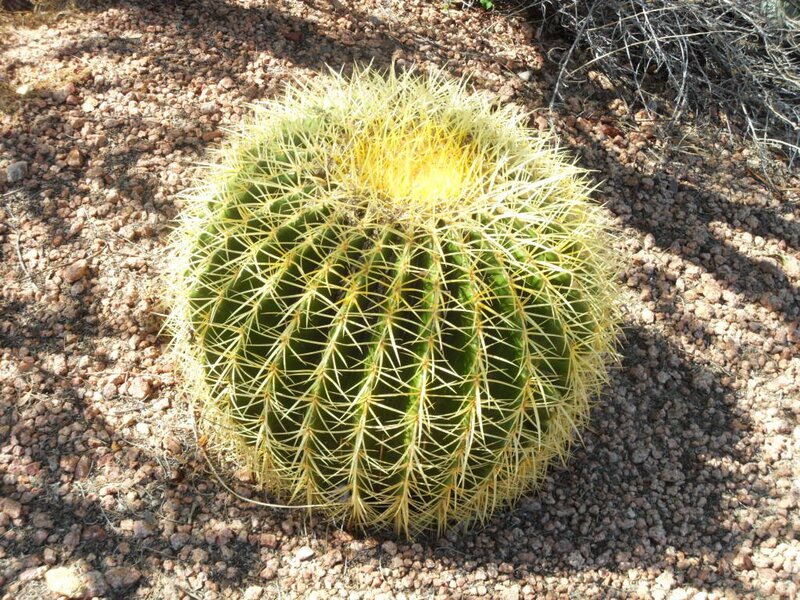 As they grow, it's not uncommon for them to stretch out so they look more like ovals than circles. 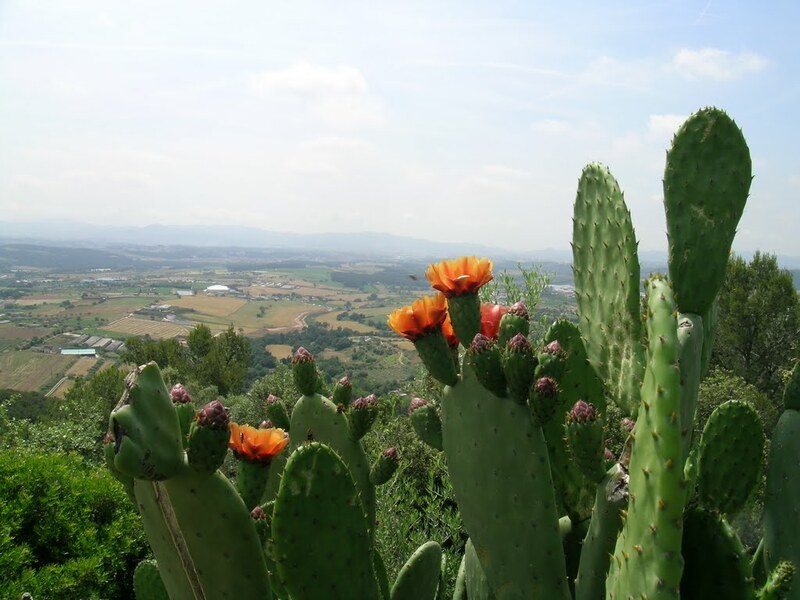 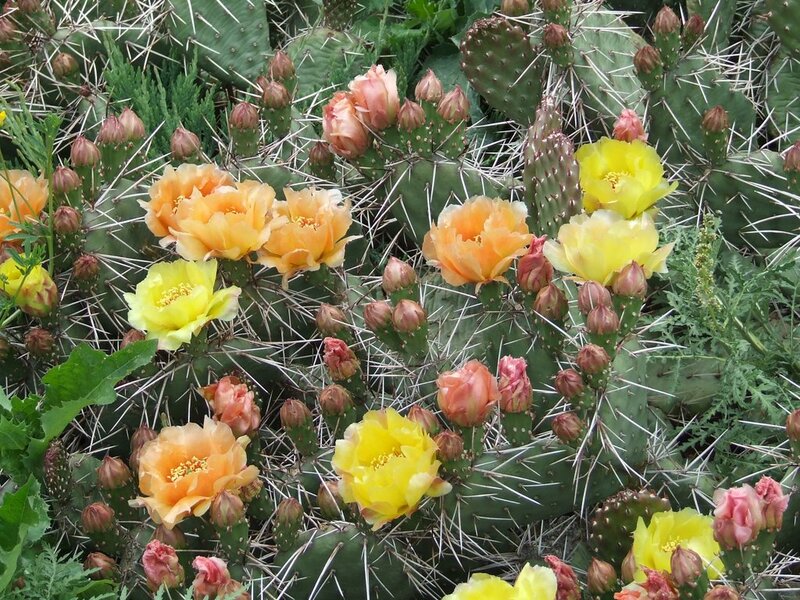 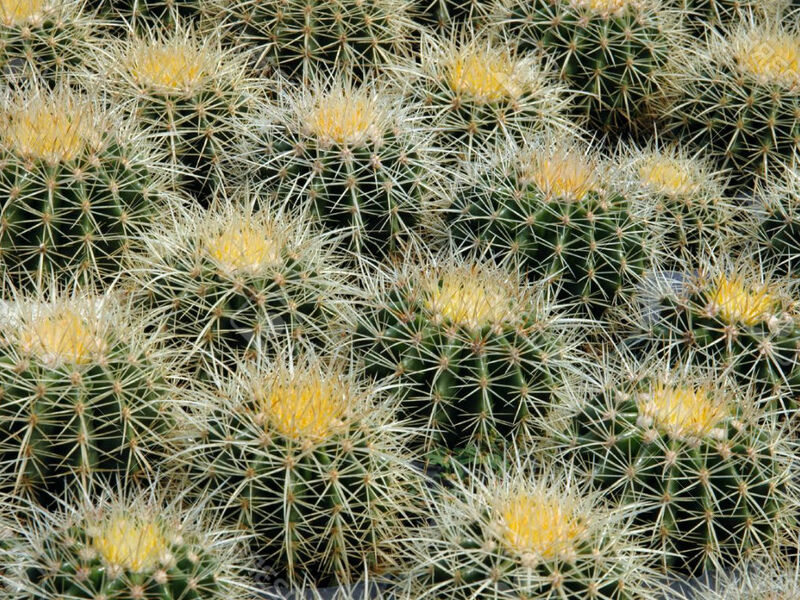 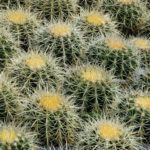 A mature cactus will bloom in the summer with flowers that grow in whorls around the top of the plant. 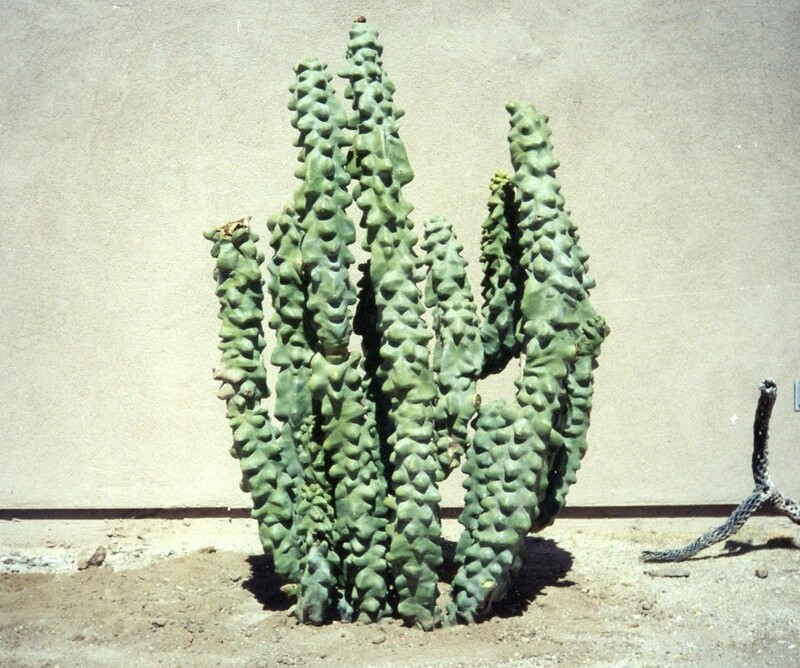 The unusual lumpy shape of totem pole cactus is attention-grabbing. 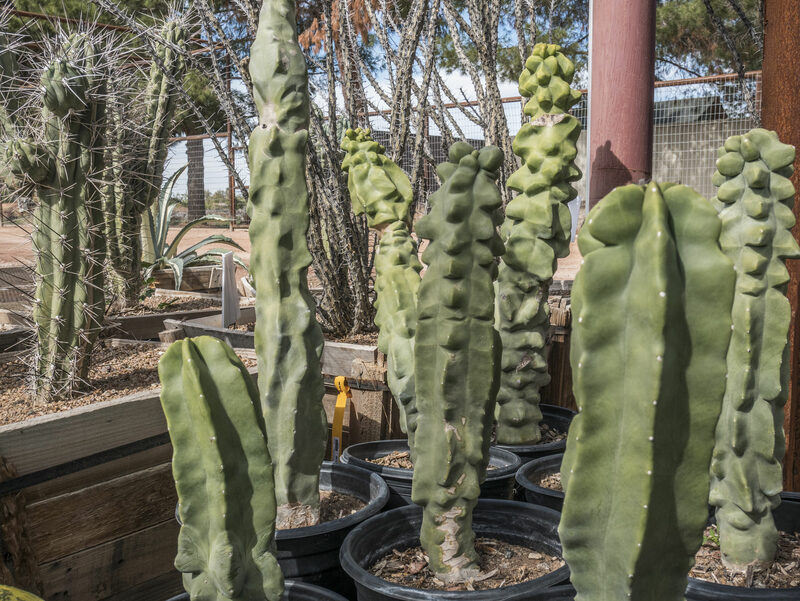 This variation of senita cactus resembles a melted candle, with randomly spaced bulbous shapes up and down its length.The columnar shape of this cactus makes it suitable for narrow areas, where it can be used in a raised bed for an unusual vertical accent. 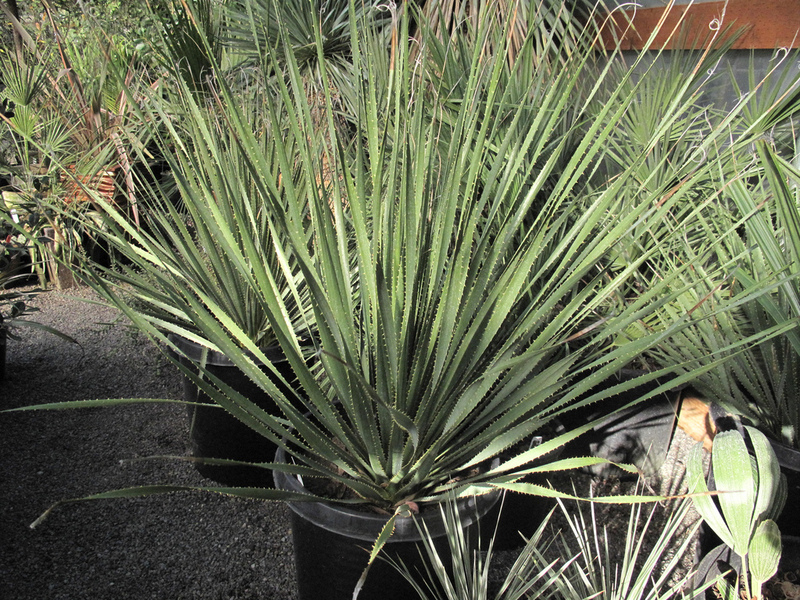 This Southwestern native also does well in containers when planted in a mixture of equal parts potting soil, sand and perlite. 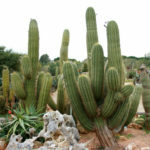 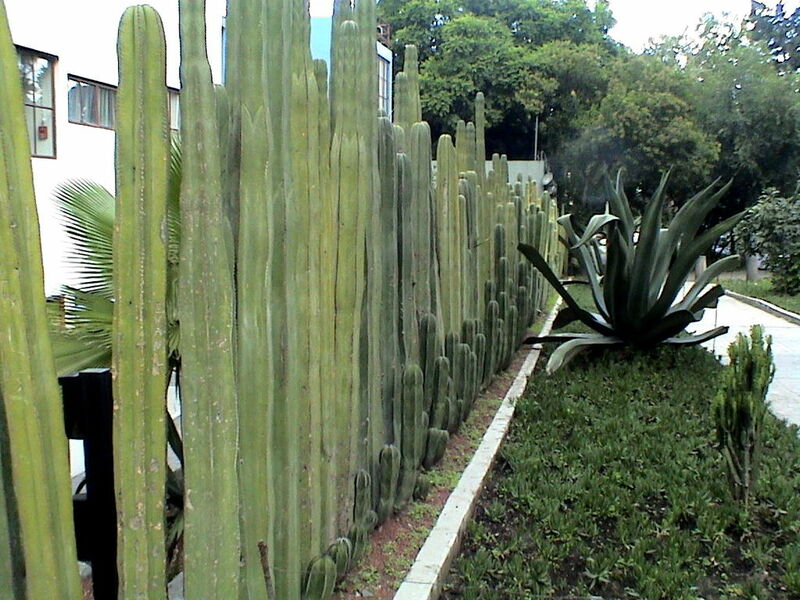 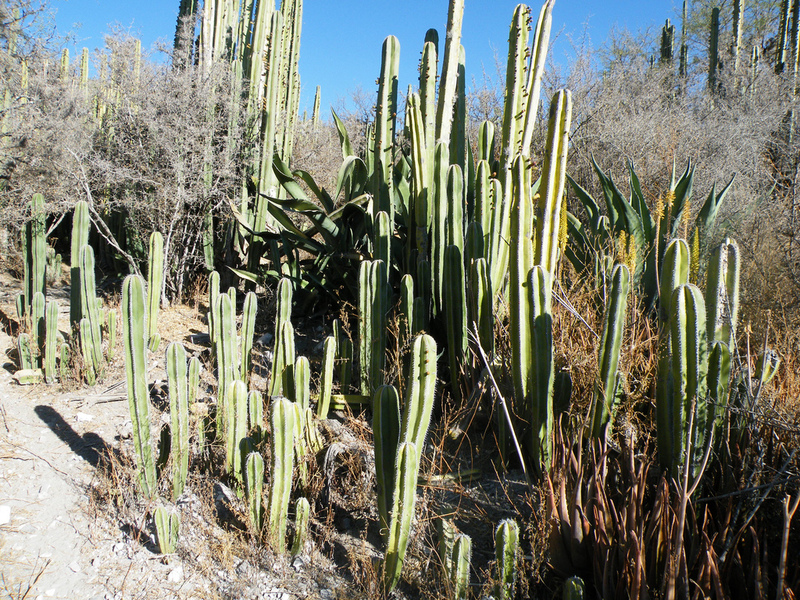 This handsome cactus has tall, columnar trunks and reaches heights of twenty feet, or more. 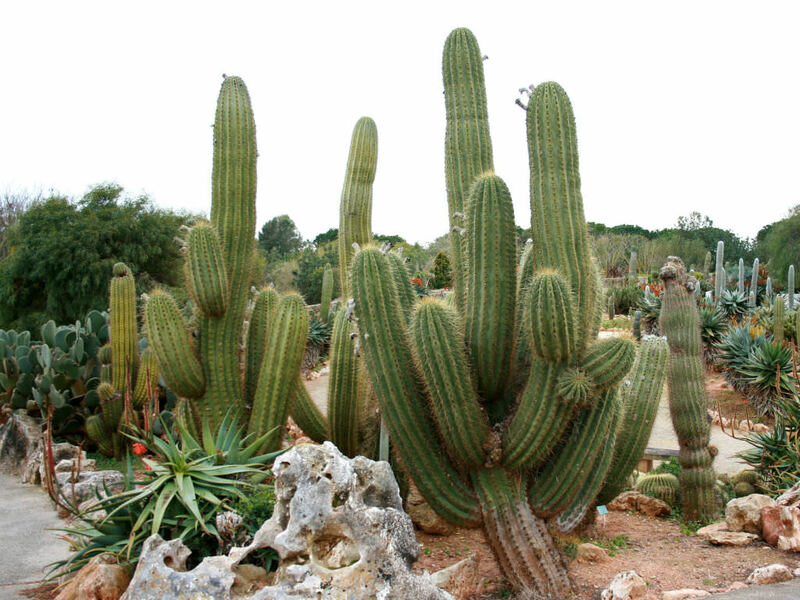 The plant develops many arms during its lifetime and grows quicker with supplemental irrigation. 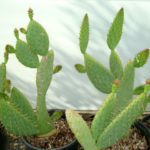 It is deep green with ribs that have minor spines. 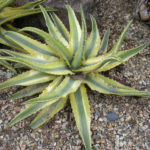 Its central spine is yellowish and the smooth stems have five to seven ribs. 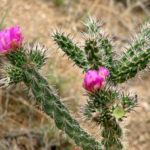 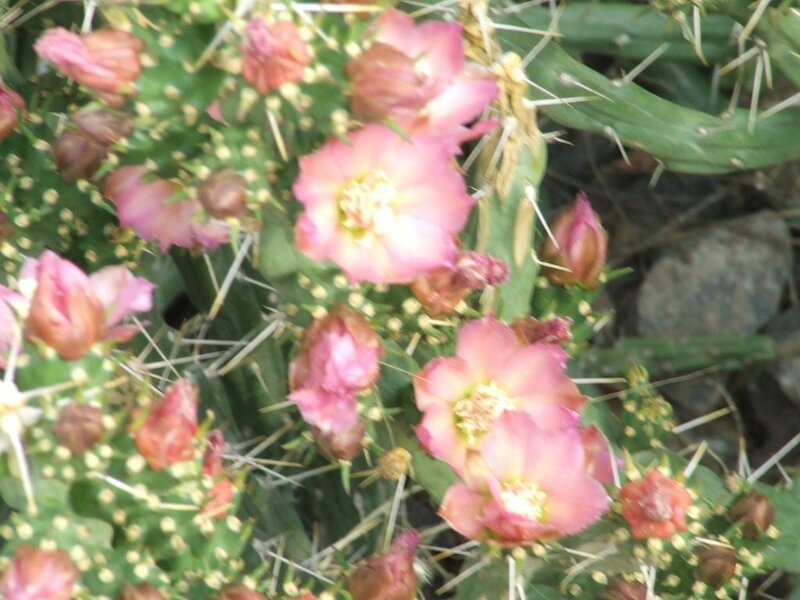 In spring, the cactus produces tubular, pinkish-red flowers that are very showy. 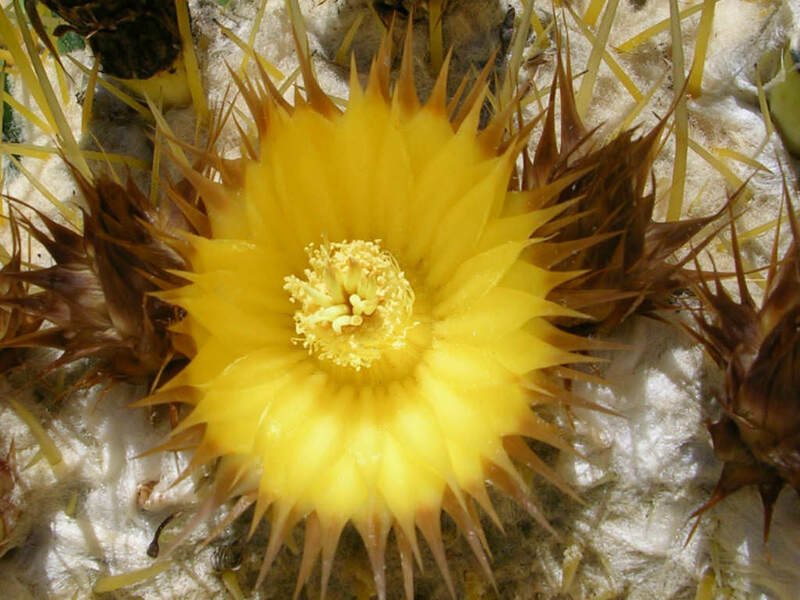 Following the bloom cycle, it develops spiny, yellowish to red fruit with black seeds. 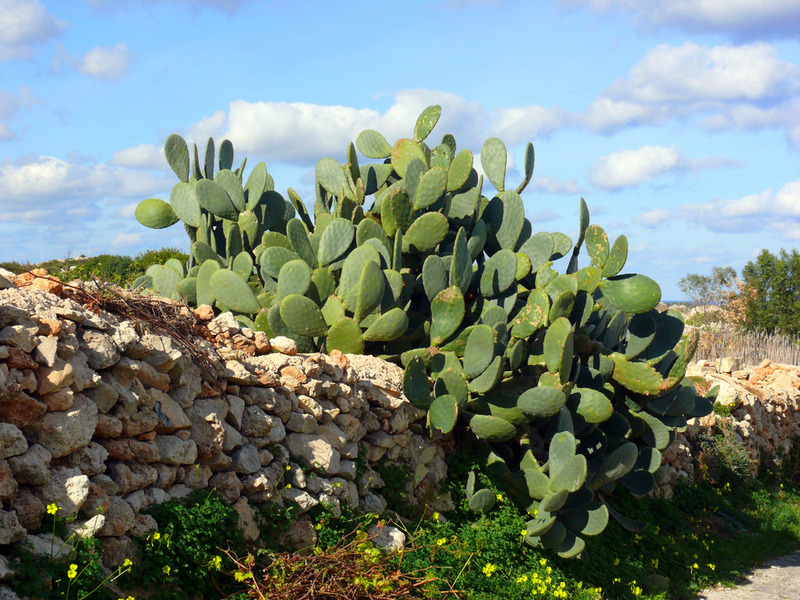 Reaching out up to 10 feet, Indian Fig Prickly Pear Cactus cover a much larger span then the traditional Prickly Pear variety. 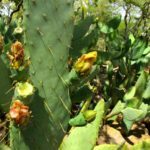 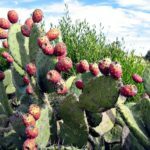 The Indian Fig Prickly Pear Cactus grows a large cluster of paddle shaped leaves that can propagate several edible and sweet purple fruit. 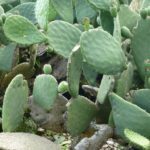 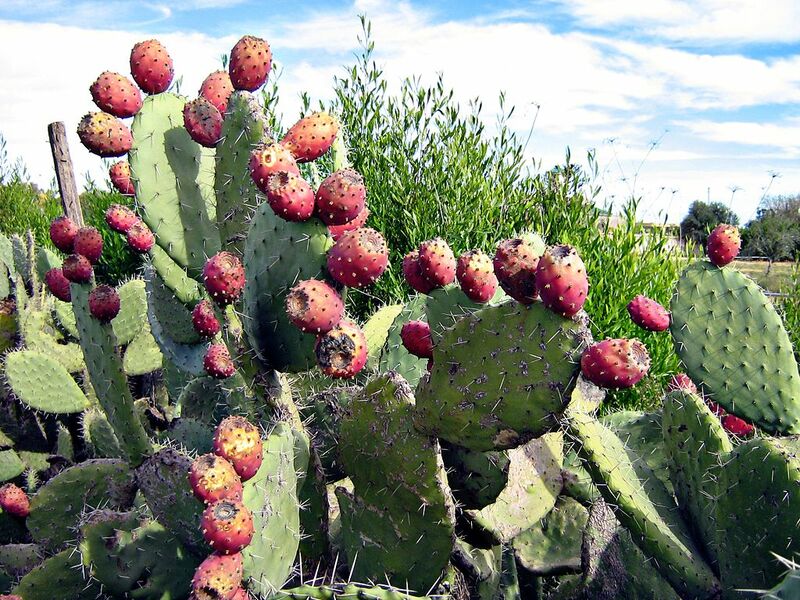 Native to Mexico, Indian Fig Prickly Pears are suited to our environment and are fast growers, so they don't require much watering or care after they're established. 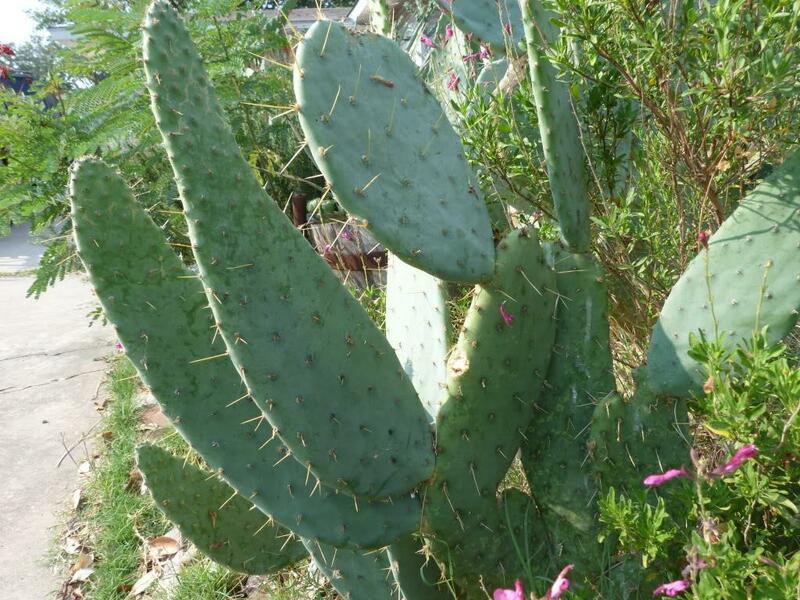 In Mexican Spanish, the plant is called nopal, while the fruit is called tuna. 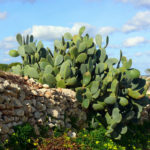 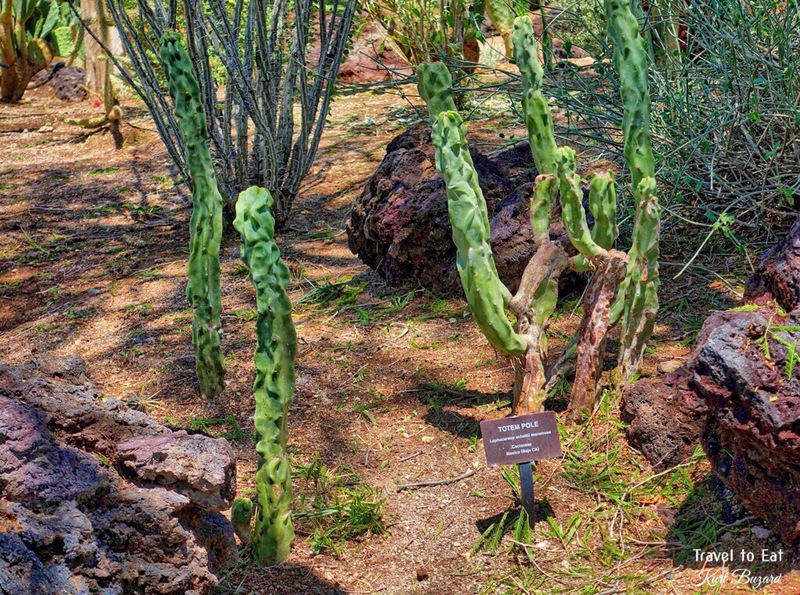 Named for its uniquely spade-shaped leaves, the Cow's Tongue Prickly Pear Cactus grows several large upward leaves that reach up to 4 feet. 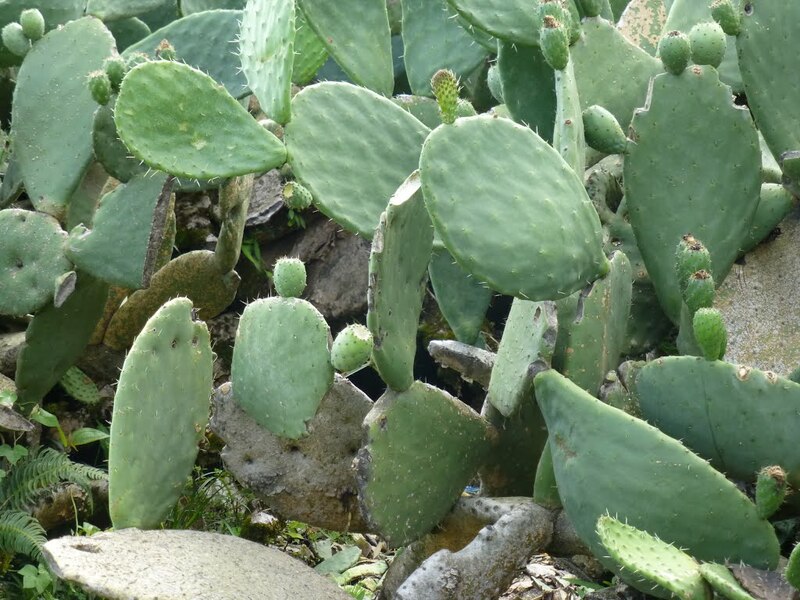 The recognizable color and texture is reminiscent of most Prickly Pear varieties, but the unique shape of the Cow's Tongue Prickly Pear sets this species apart from the pack. 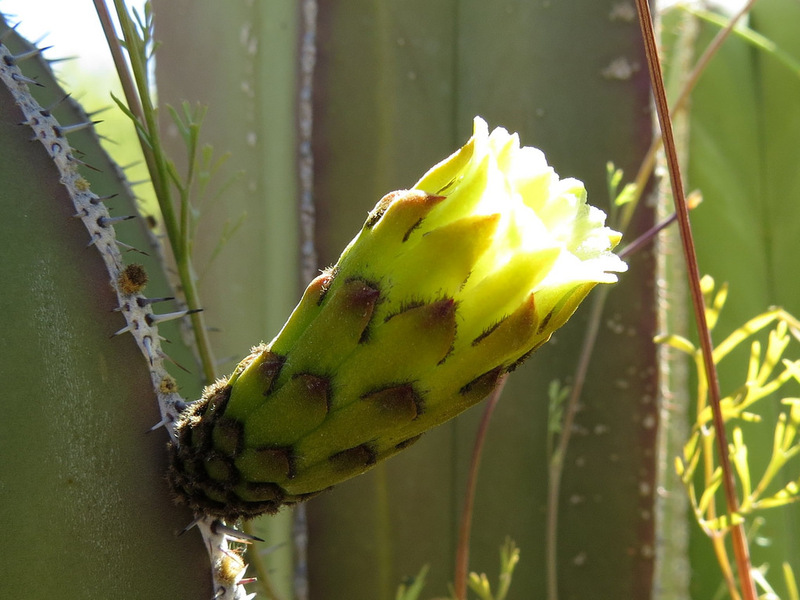 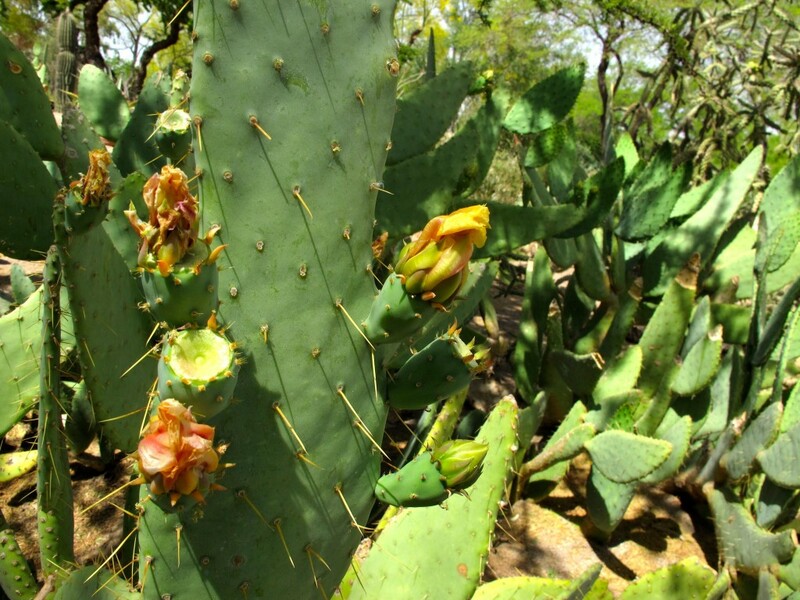 The Cow's Tongue Prickly Pear blooms large yellow flowers in late spring, followed by large pods of edible red fruit. 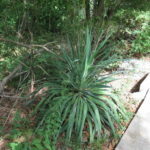 The original habitat is northeast of San Antonio at around 500' elevation. 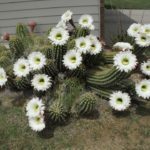 One of the largest of the Echinopsis species, this fast-growing, attractive, columnar cactus reaches heights of 25' or more. 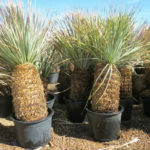 Mature plants will develop branches or side arms that are 10" in diameter and have 8 to 14 deep ribs with yellow spines. 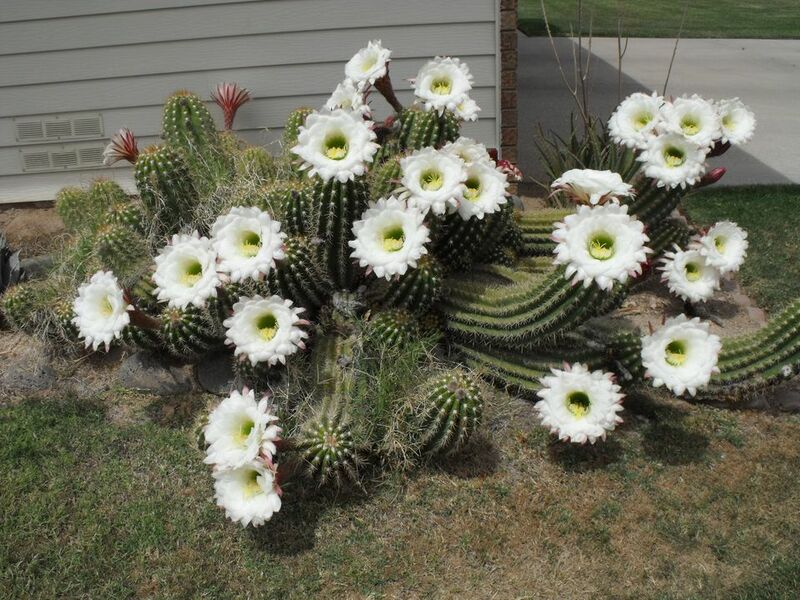 In late spring, it produces showy, white, nocturnal blossoms that are 8" long with dark red to green outer segments. 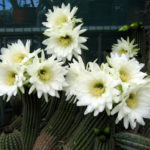 Use it as a substitute or in combination with the saguaro cactus, where a strong, vertical accent plant is needed. 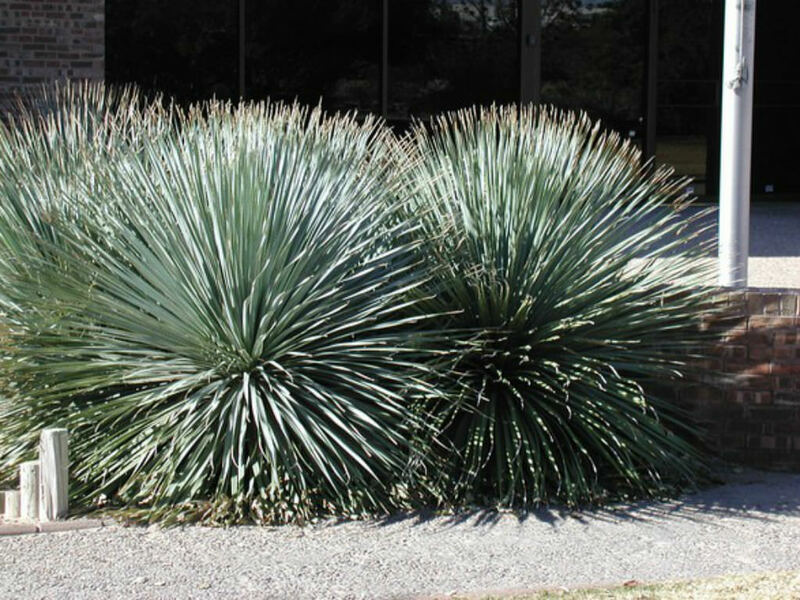 Native to northern Argentina. 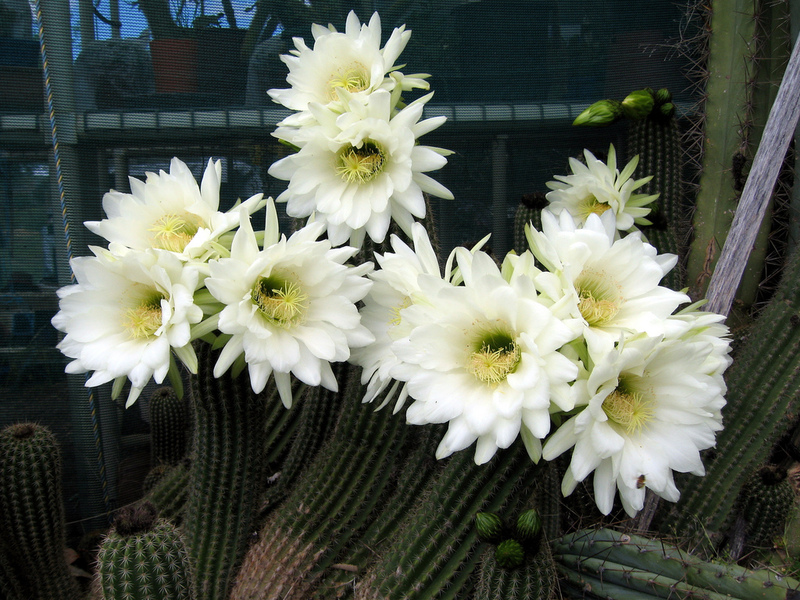 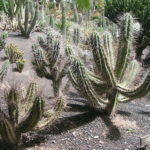 The distinctive, night-blooming cactus grows 30' tall and 10' to 15' wide. 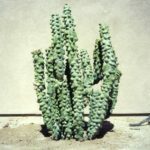 Its columnar, grayish-green stems are approximately four inches in diameter with toothpick-like, grayish-white spines, protruding from the plant. 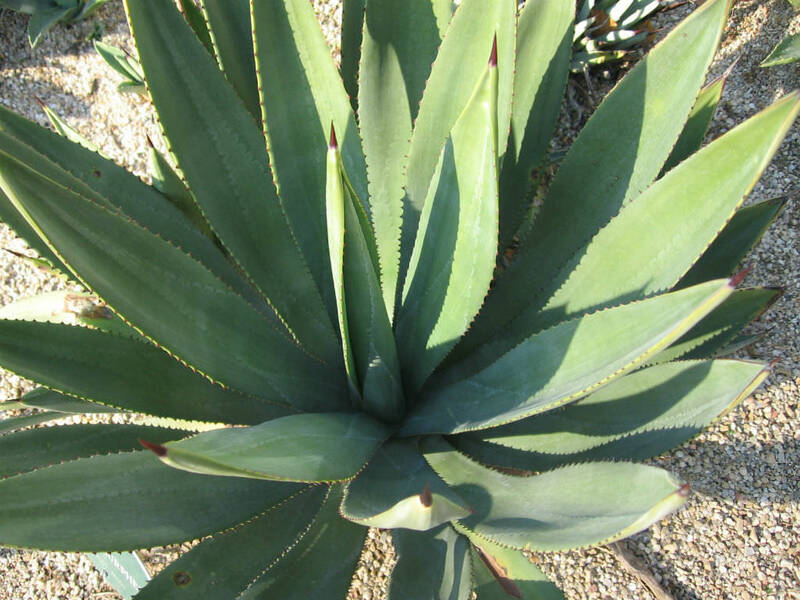 Its stems develop 8 or 9 rounded ribs with shallow grooves. 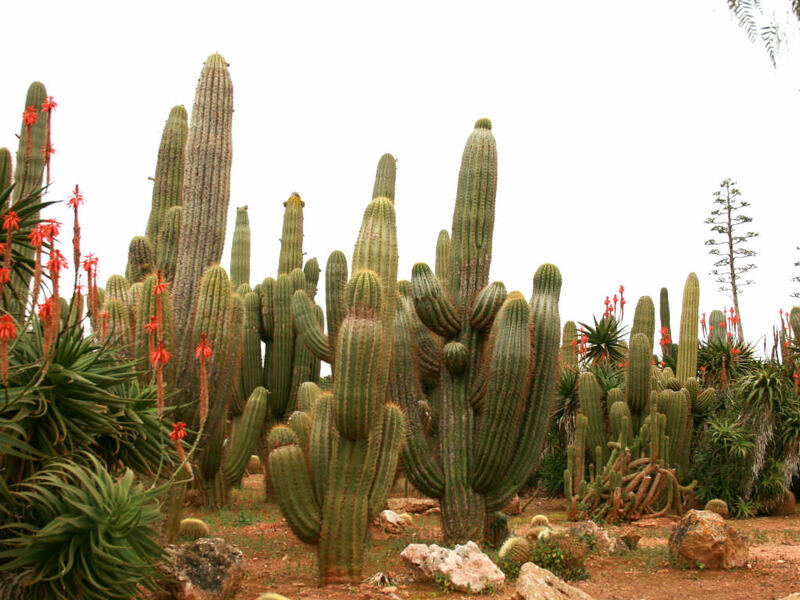 The cactus grows at a moderate rate. 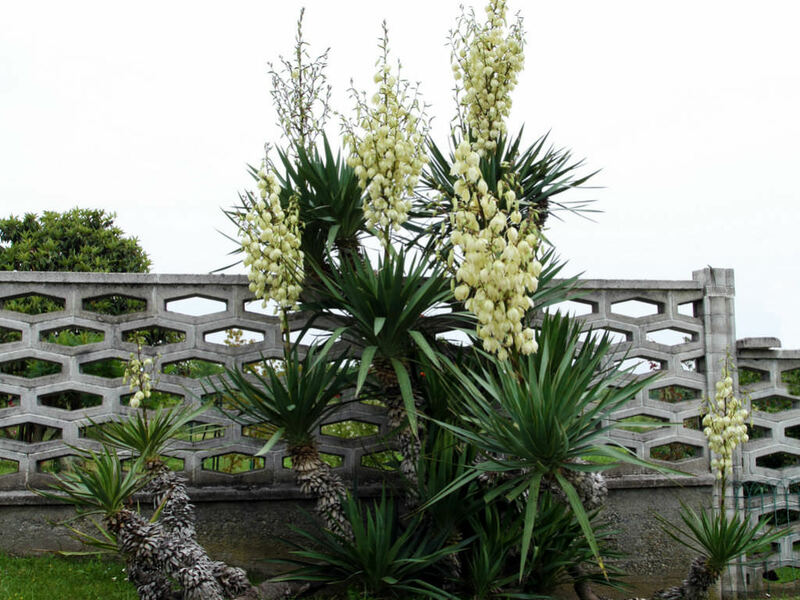 In late spring to early summer, showy, white blossoms with gray edges open at night and close during the day. 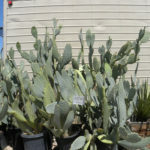 This is a great accent plant to use in cactus and succulent gardens and as a focal point. 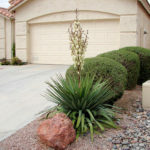 The popular and widely planted Yucca gloriosa var. 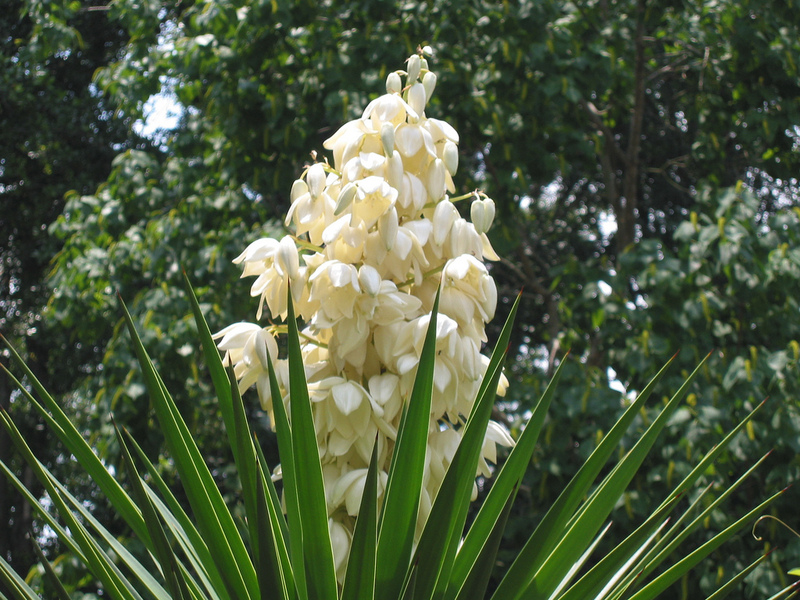 recurvifolia is admired for its exceptional adaptability, elegant upright habit and prolific flower display. 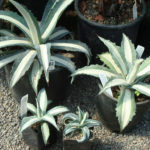 Young plants produce bold dense rosettes of broad, strappy, deep blue-gray leaves. 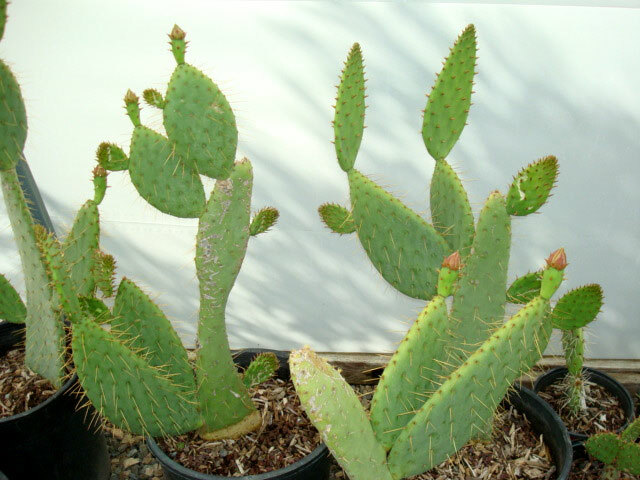 These have sharp tips and are so long they bend downward. 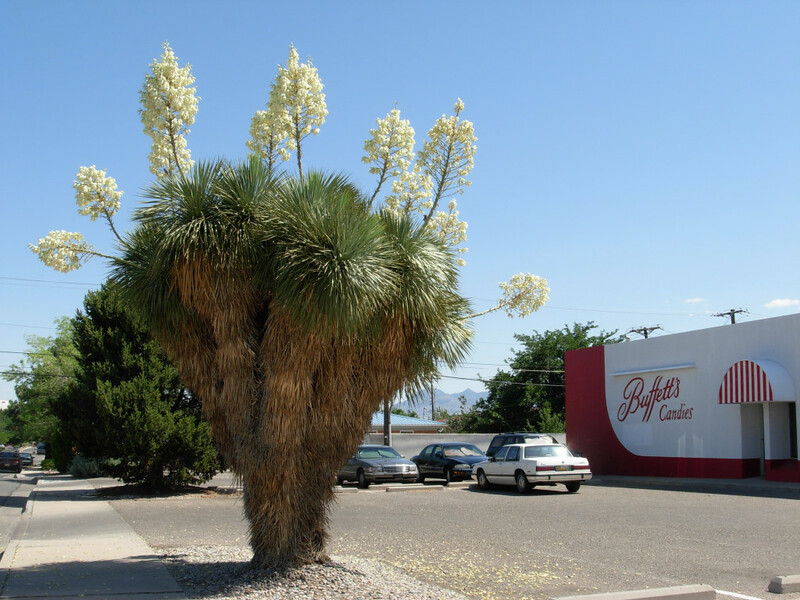 In time, it develops a broad, short, trunk-like base that gives the plant a squat tree-like appearance. 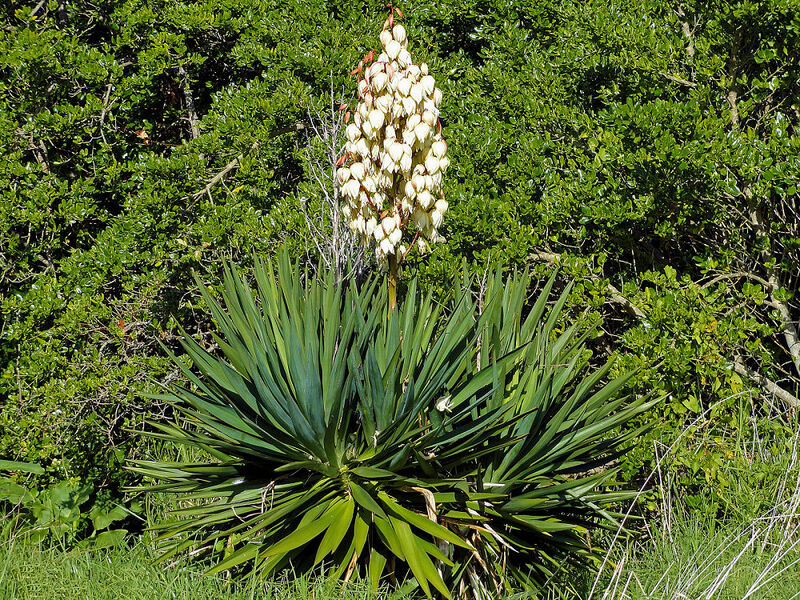 Each rosette produces a tall, upright, branched flower stalk that becomes covered with bell-shaped blooms of ivory. 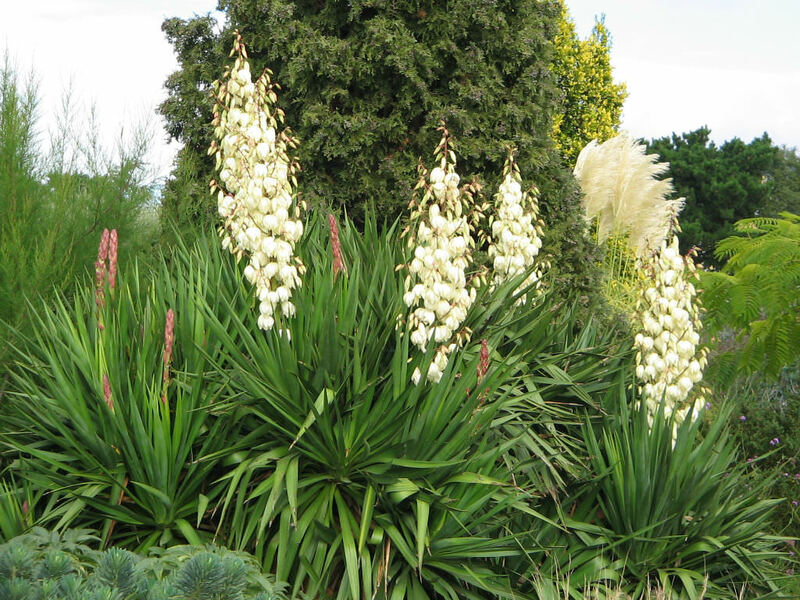 The blue leaves, tall narrow trunk, and spectacular summer display of creamy white flowers combine to make this one of the finest yuccas for ornamental landscapes. 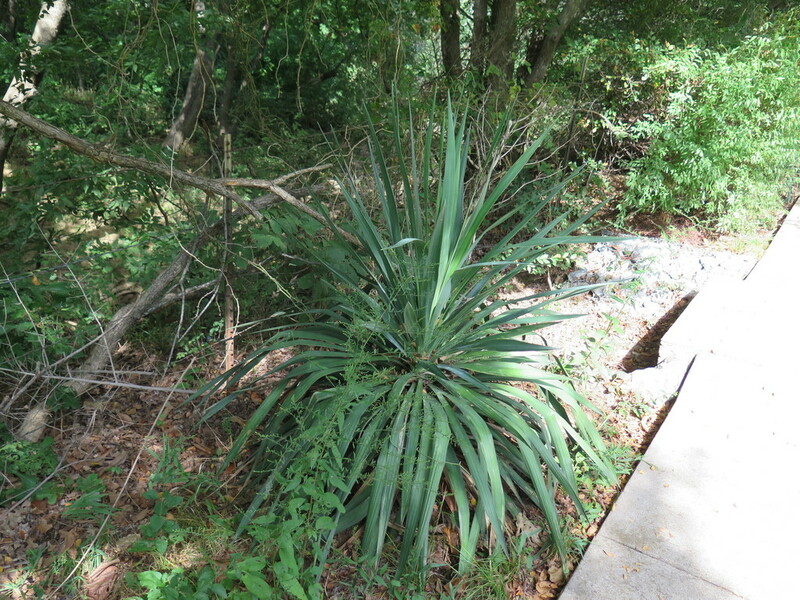 Yucca rostrata forms a trunk to about 10' tall. 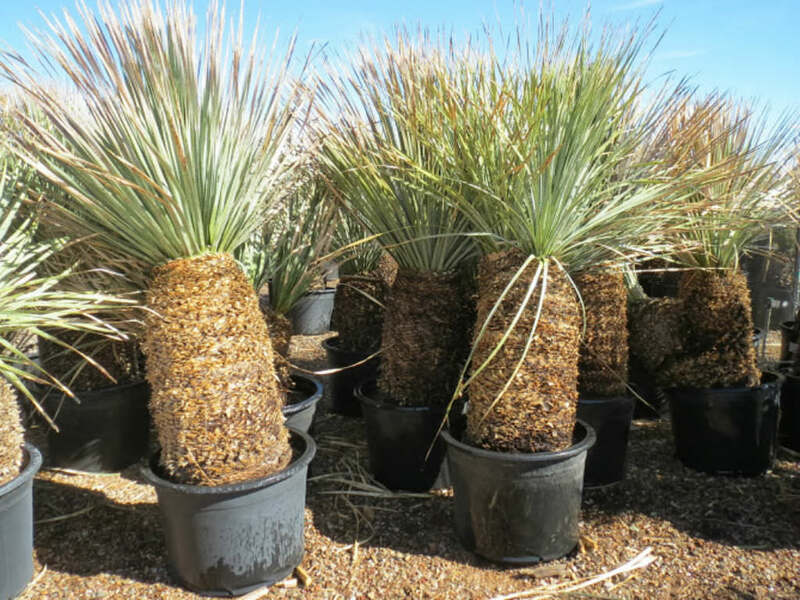 Young plants are usually unbranched, but older plants may develop multiple heads near the top. 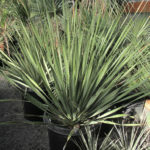 The narrow blue leaves are up to 2' long by ½" wide, and end in a sharp terminal spine. 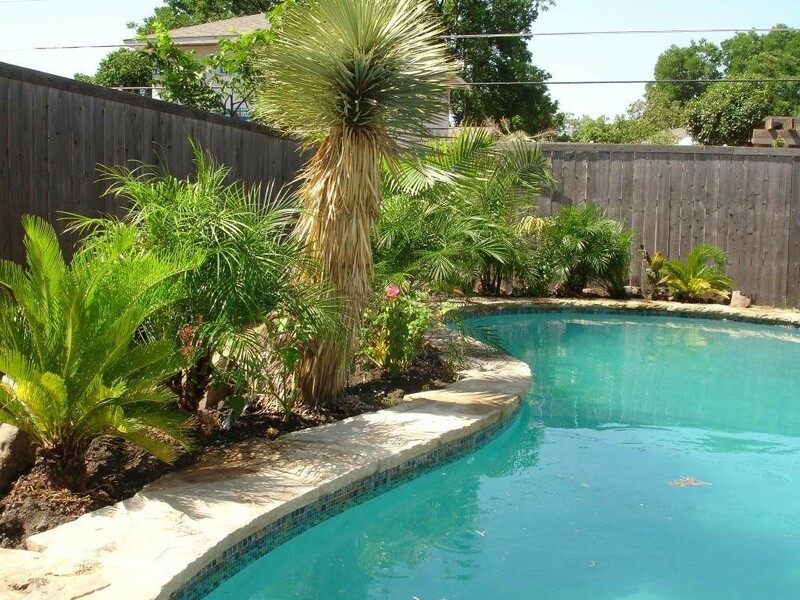 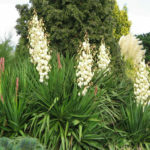 This yucca is one of the most adaptable and versatile species, handling extreme heat and cold with aplomb. 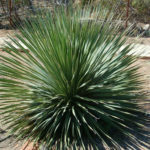 Spanish dagger is in the Agavaceae family and starts life as a clump of green foliage growing directly from the ground. 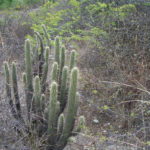 Over time, the plant grows into a small tree, usually reaching about 5 feet tall and with its leaves in a clump on its top. 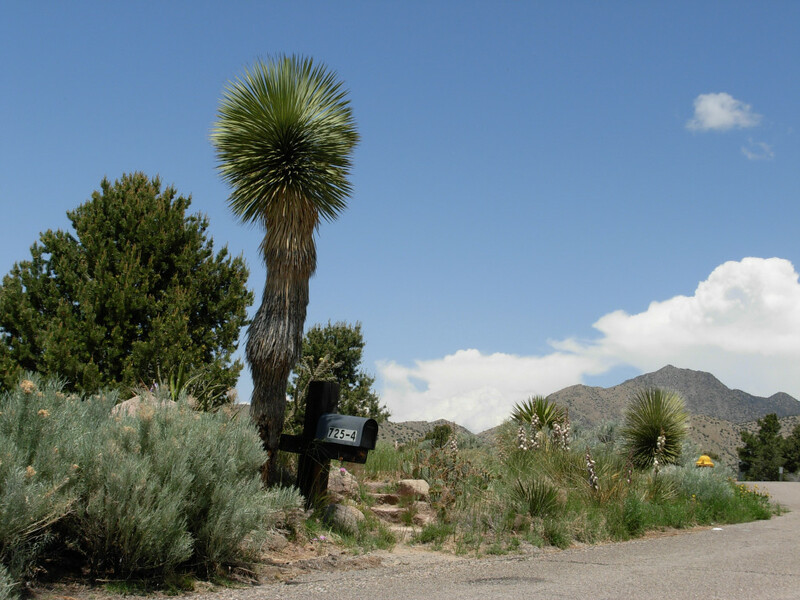 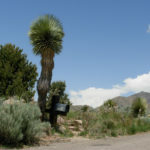 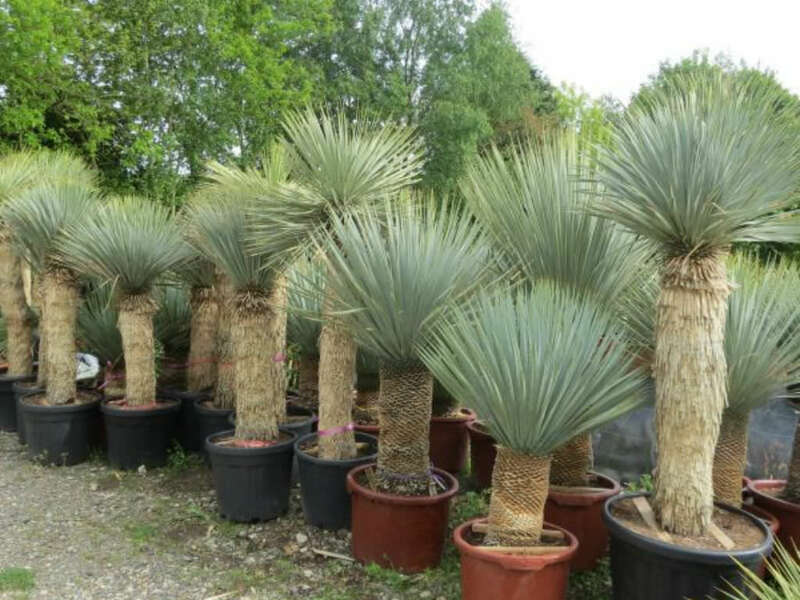 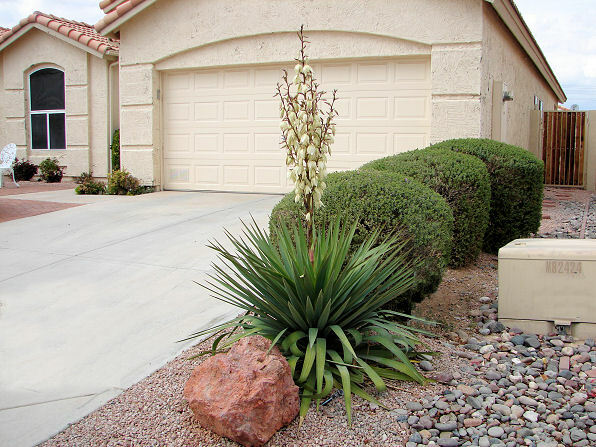 Spanish dagger yucca is used primarily as an ornamental species. 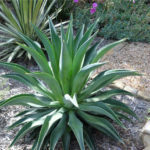 It works well in garden beds and borders as well as on slopes and in rock gardens. 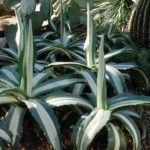 Even in a moist location, the plant grows well in a drier garden area. 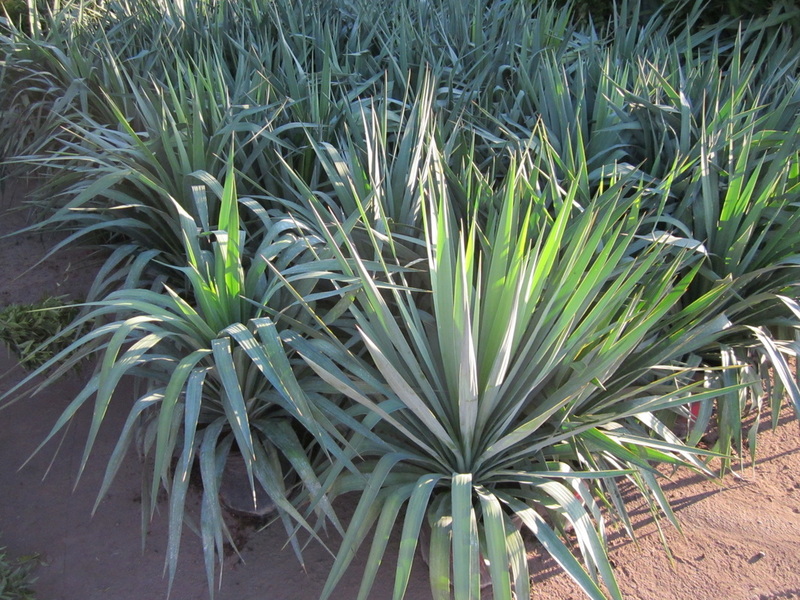 Spanish dagger grows best in full sun or partial shade in a wide range of soil types. 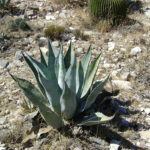 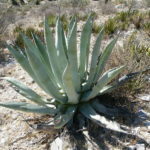 Desert Spoon or Sotol is a long-lived native of the native Chihuahuan desert. 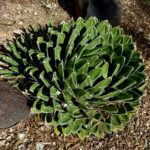 Its attractive evergreen succulent forms a large rosette of toothed blue-green leaves that beautifies the landscape year-round. 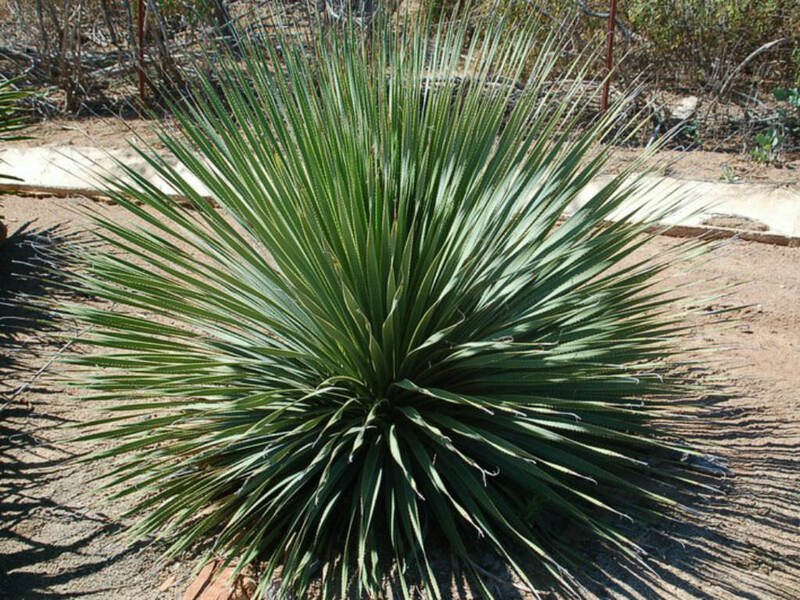 Often confused with yuccas, sotols have long slender leaves that arch gracefully from a central trunk, making a symmetrical, rounded form. 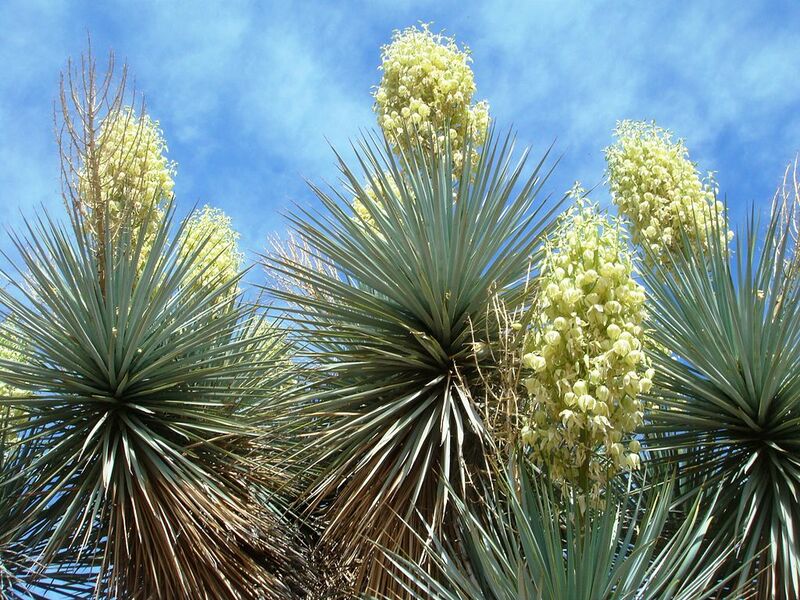 Once mature, the plants bloom with a tall, pole-like flower spike that holds on the plant for through the winter. 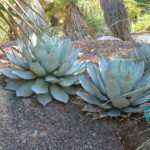 Extremely tolerant of drought, heat, and soil type, they must have well-drained soil. 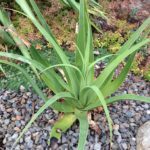 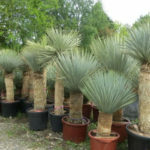 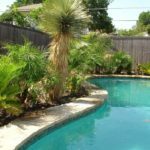 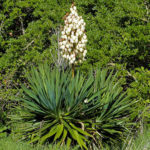 Not a yucca, this member of the Century-Plant family produces soft, yucca-like, evergreen leaves, 2-3 ft. in length, crowded on the perennial’s short, woody base. 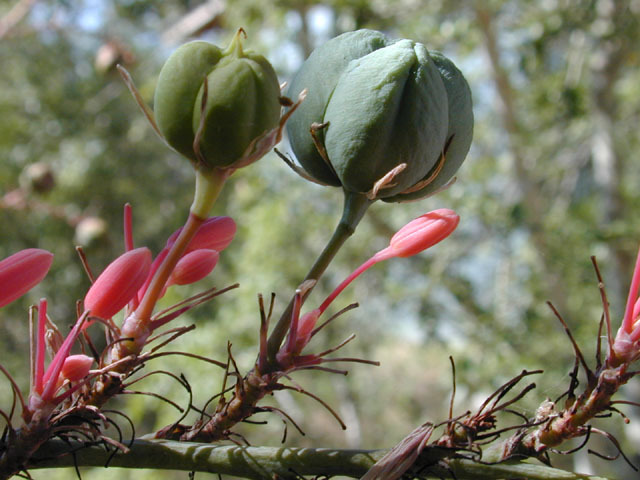 The flower stalk rises 5 ft. and bears showy, coral-colored, tubular flowers occur on arching, wand-like, pink stems. 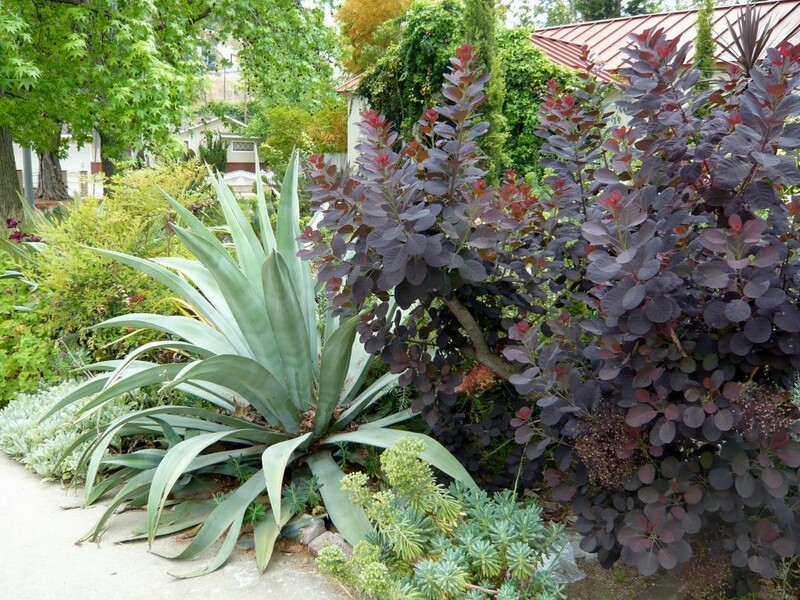 Leaves are plum-colored in winter; blue-green other times. 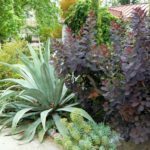 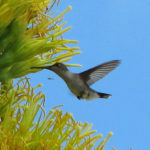 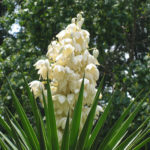 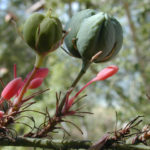 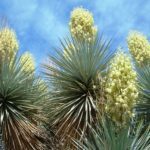 Coral Yucca is evergreen, drought-resistant, and adaptable to a variety of soils. 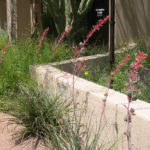 Deer browse the foliage, while the flowers attract hummingbirds. 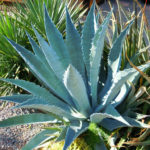 An evergreen perennial, best used with other desert-like plants.